Grand Gulch, the place has held a special place in my memory bank since the last time I walked through it 38 years ago. 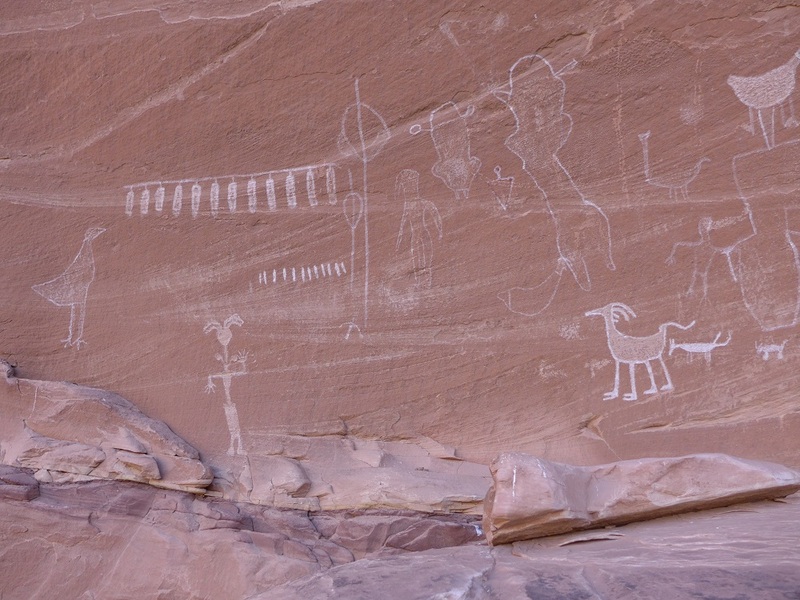 In the late 70’s relatively few people even knew about Cedar Mesa, its canyons and its myriad of Native American sites. I did two trips back then, one at Thanksgiving 1976 and then quickly again the next spring. 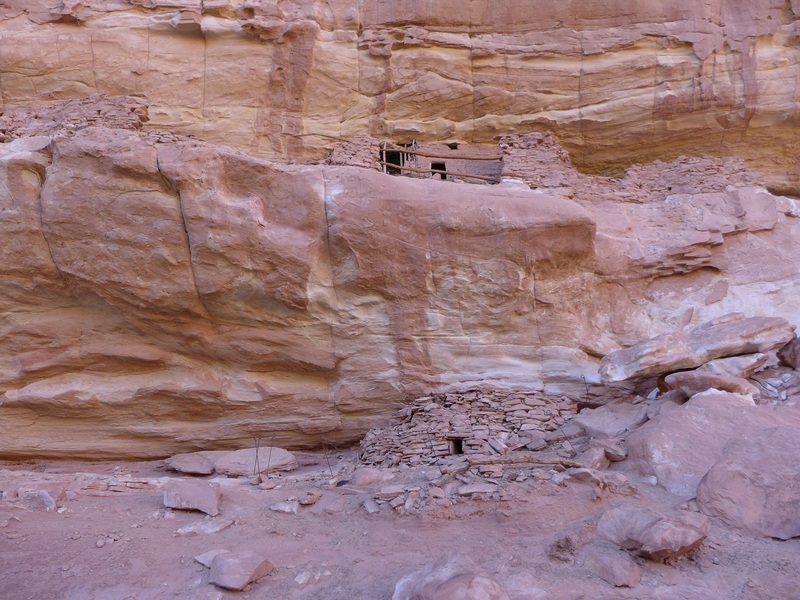 We were of course amazed at the beauty of the canyons but also the number of ruins we found around every bend. 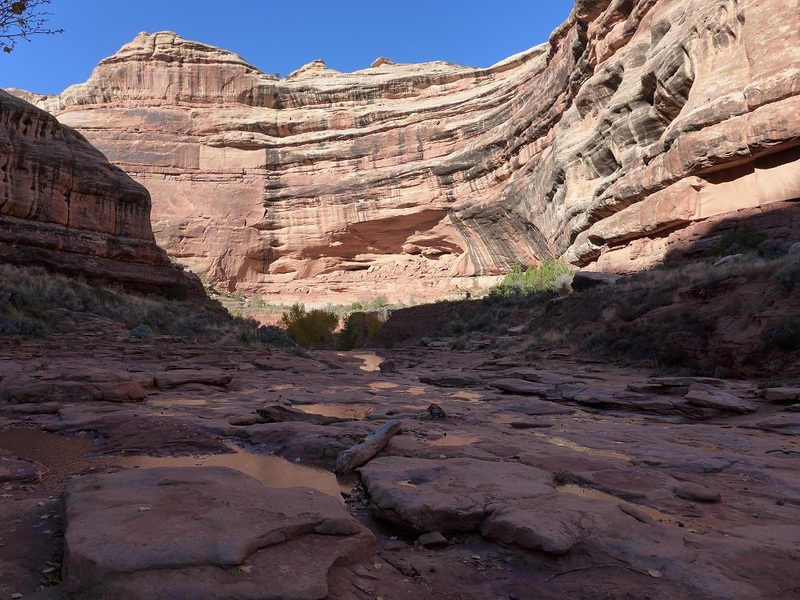 Cedar Mesa in the SE corner of Utah has many canyons with Grand Gulch the longest, cutting down the heart of the mesa on its way to the San Juan River. 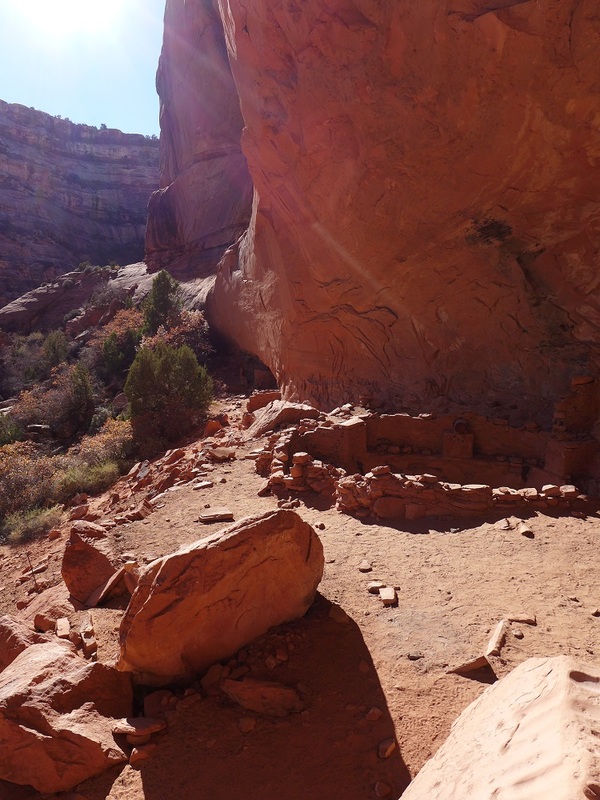 This area was occupied by Ancestral Puebloan Native Americans (more commonly known as the Anasazi) between 800 and 2,000 years ago. They grew primarily corn, beans, and squash, and made use of some wild foods as well. 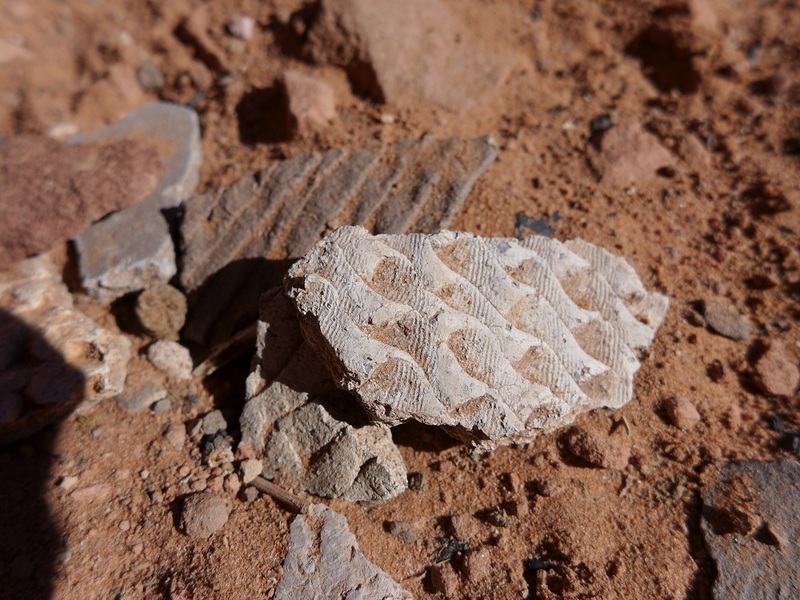 They made and used stone tools, pottery, and baskets. 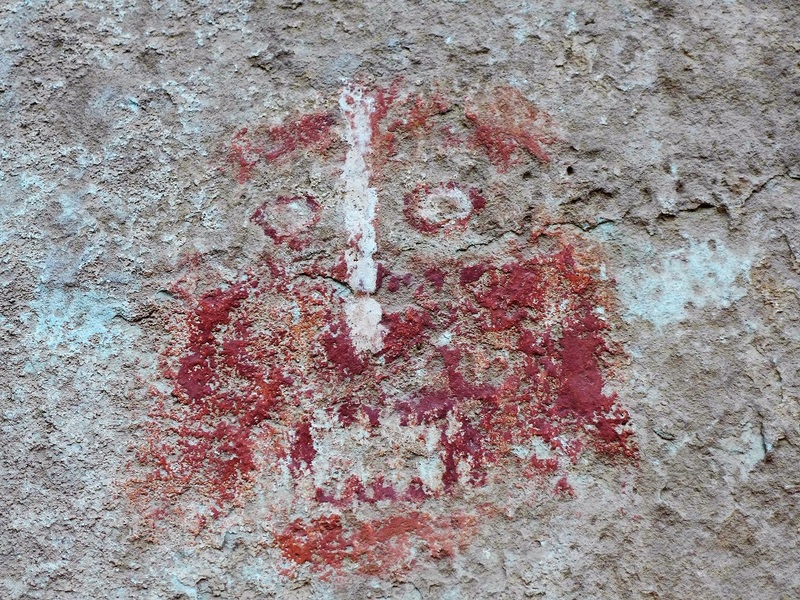 They pecked or painted rock art images on some cliff faces. 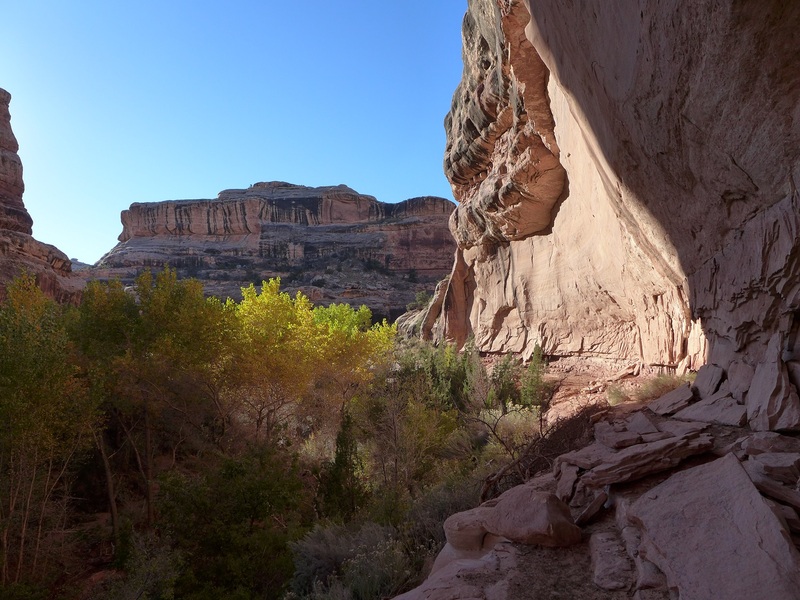 Those first two trips where just in the upper sections of Grand Gulch from Kane Gulch trailhead around to the head of Bullet Canyon, about 23 trail miles with a ~8 mile road walk/hitchhike to connect the loop, it is now the most popular area on Cedar Mesa. I knew that we had walked by tons of archeaological sites that we never saw those first two trips and that there were many more further down canyon, so this time I again wanted to start at Kane Gulch but walk all the way down to below Collins canyon then back track and come out at the Collins Spring trailhead. 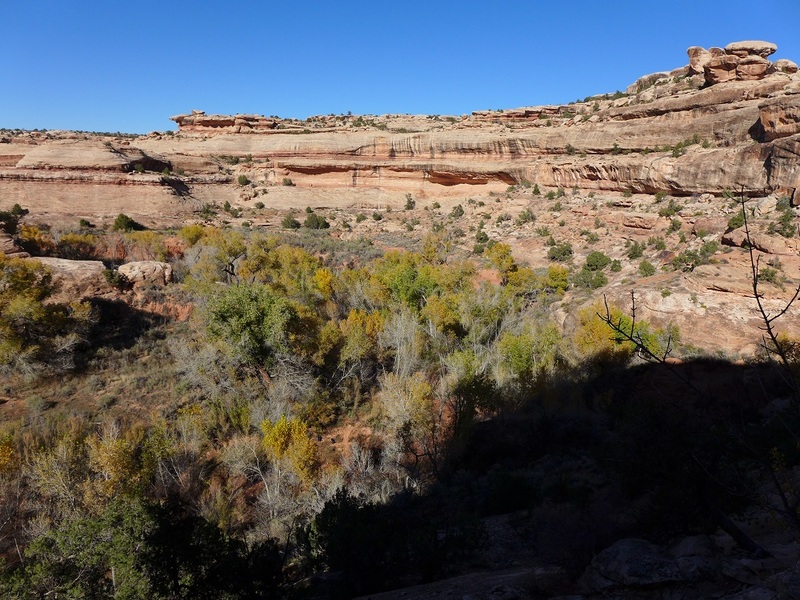 There are at least ten more miles of canyon below where we stopped but with very few sites between there and the river. In total it is 51 miles from Kane Gulch trailhead to the San Juan River, here is a mileage chart. 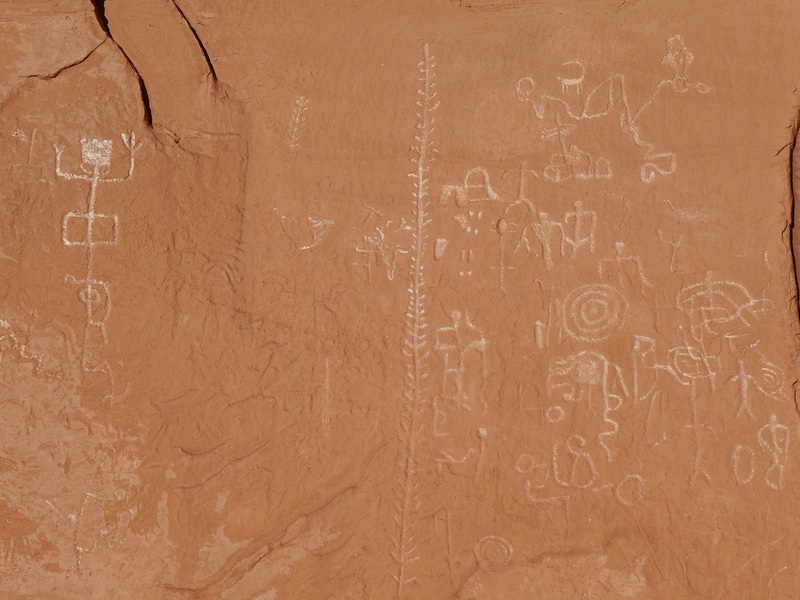 Thanks to the internet and some friends I was able to identify nearly 80 sites, both cliff dwellings and rock art panels in those 40 odd miles. It is truly an outdoor museum. 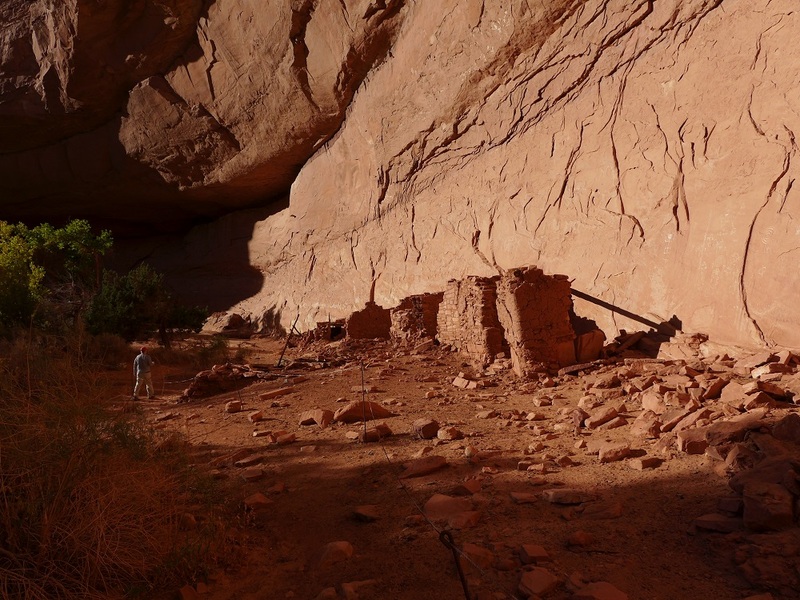 I will follow the commonly accepted protocol of not revealing the exact locations of these sites (but many are known on maps already) as part of the adventure is to find them for yourself. 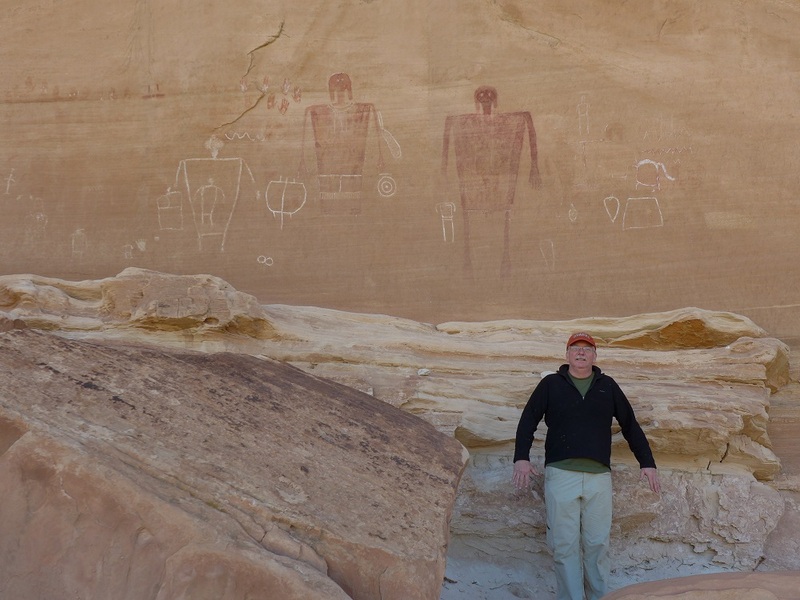 This was a perfect trip for Scott as he loves to walk in a canyon with some water and loves to find Native American sites. I thought that only planning for 7 miles a day, with pack, would allow us plenty of time to look for and scramble up to sites, in the end, not so. Logistical information to follow at the end of the report. 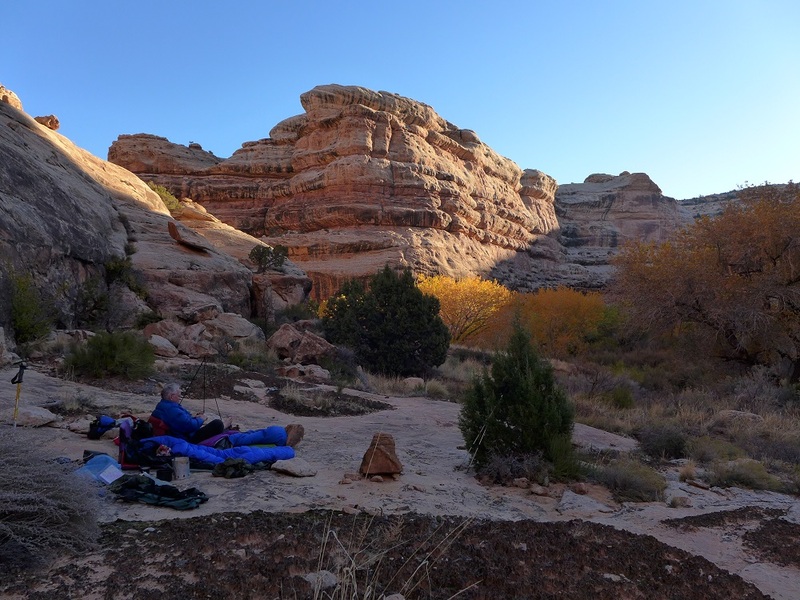 To me the perfect time to be in Southern Utah is late October but the earliest we could get away was the second week of November, sometimes sketchy weatherwise. It did put us after the “high use season” when they limit the number of people who are allowed in overnight, a permit is still required but not a problem. 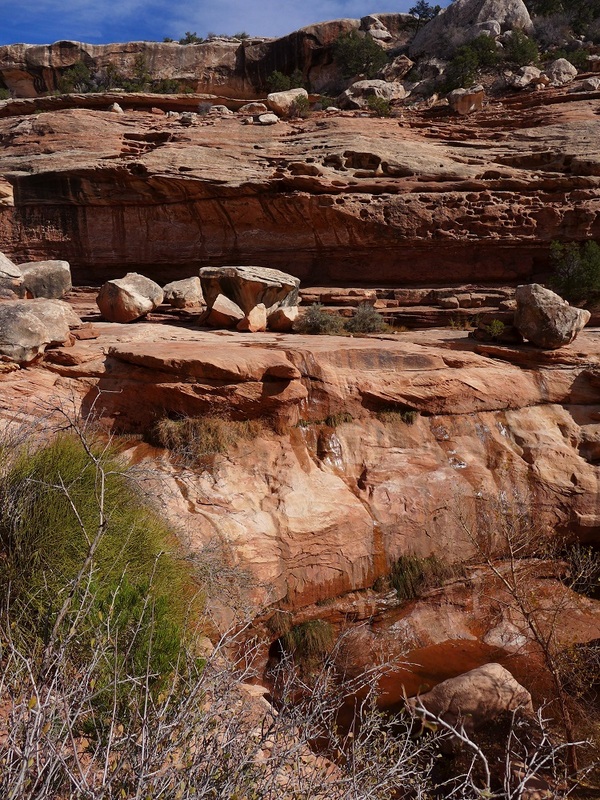 The other limiting factor can be water but that corner of Utah has had abundant rain this year and is, at least for now, out of the drought that has gripped the area for years so we had no worries about finding enough good water. We flew into Albuquerque early, stopped at REI for gas canisters and some last minute items and then headed northwest stopping for a great New Mexican lunch at El Brunos in Cuba, Farmington for some groceries and then making it to Blanding for the night at 6:30. Packing and a few beers before crashing. Our shuttle, Dallin from Four Corners Adventures, arrived at the motel on time at 8:00 and we followed him out to the Collins Spring trailhead by 9:30 to leave our vehicle. With all the rain this summer the 6.5 mile dirt road into the trailhead was in bad shape and it was good that we had rented a small, high clearance SUV. As we were getting ready to leave a van load of young women from the Rocky Mountain Institute rolled in to start a 10 day trip (not going our way), they all were wearing tutus! I told them because I was going ultralight I had left my tutu at home. Certainly a first. The 20 mile shuttle over to the Kane Gulch ranger station and trailhead took about an hour and we were on the trail by 11:00. 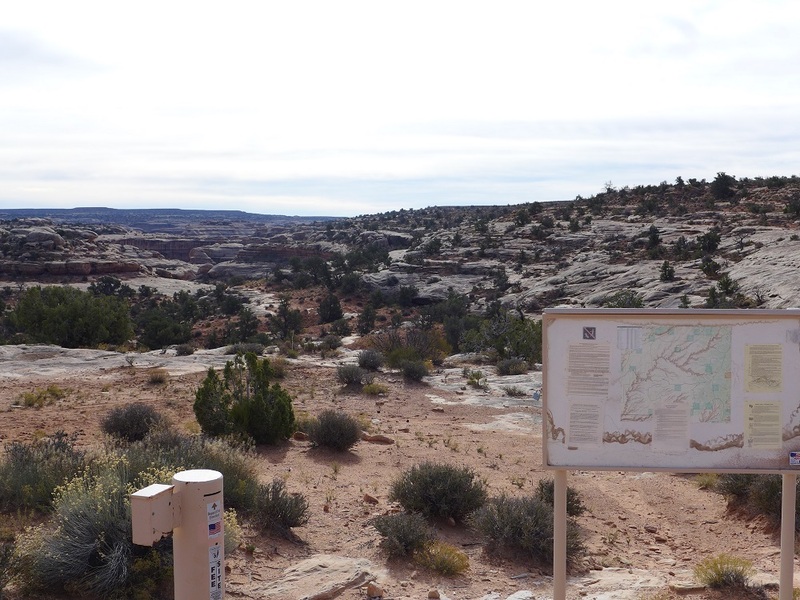 The ranger station closes for the season Oct. 31st so we didn’t have to watch the required video about how to behave around the archeological sites but we also couldn’t get up to date water reports. 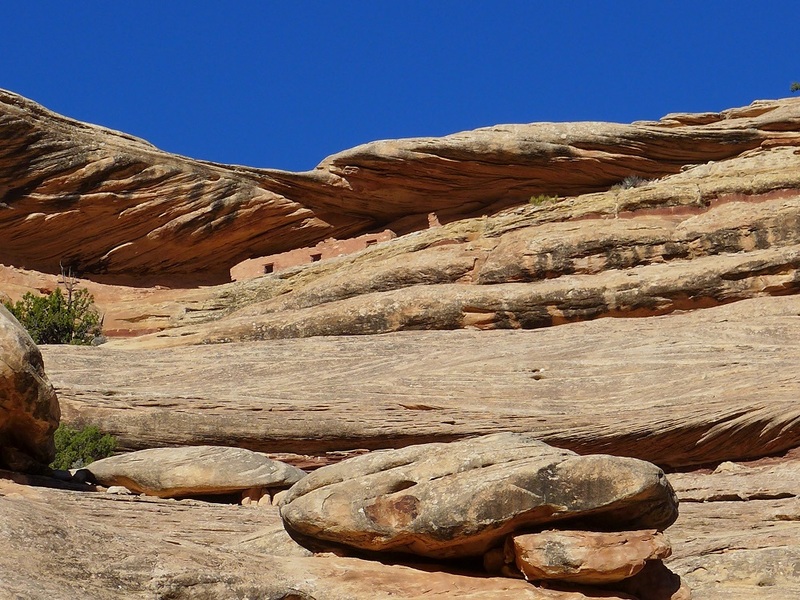 but fairly quickly begins to cut down into the Cedar Mesa sandstone. 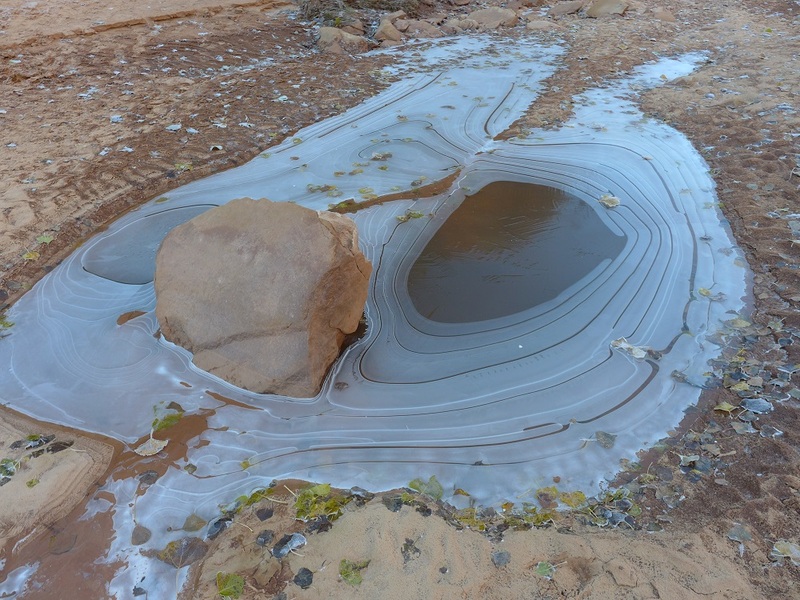 There are a few bigger drops mostly around pouroffs and there was water flowing all the way down to the junction with Grand Gulch itself. After the last big drop we had lunch looking at the increasingly big walls and alcoves, trying to spot the first granaries high up on the walls. 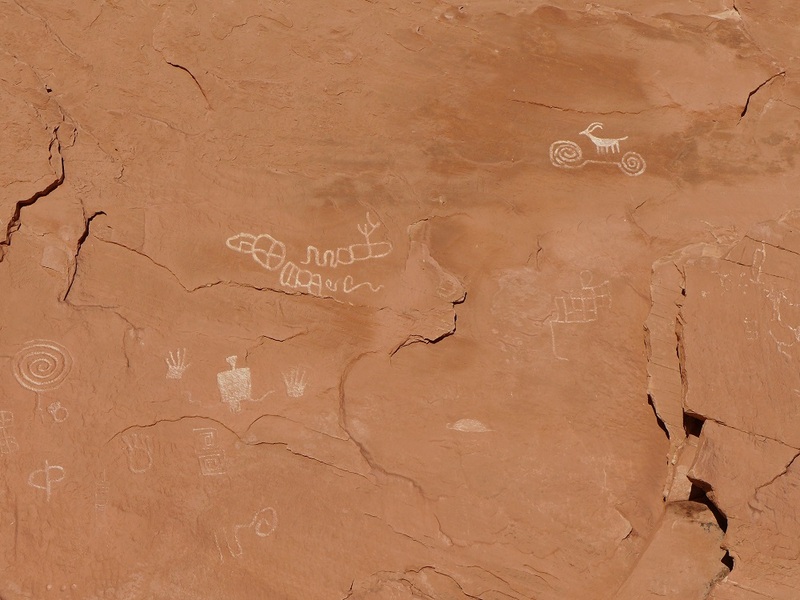 but spent some time at “Ruined” ruin and it’s rock art panel including “sheep on a bicycle”. 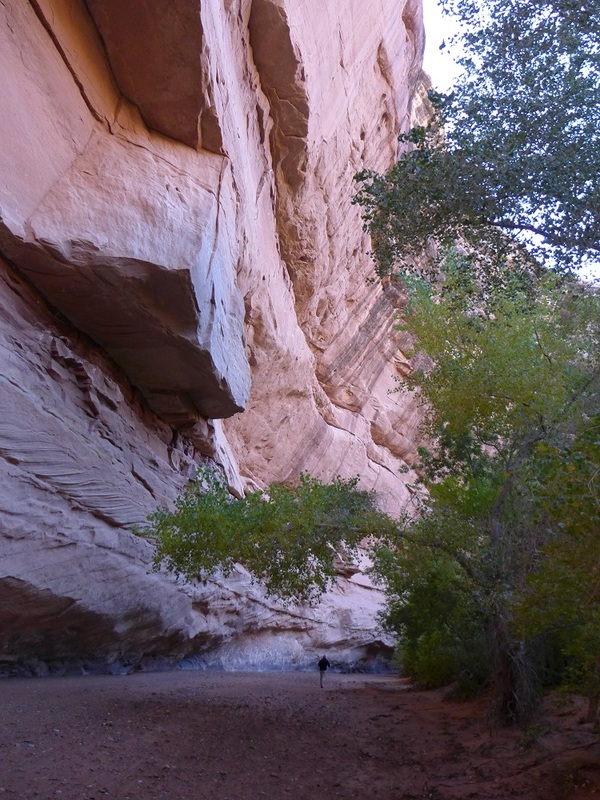 Not much water in this section of the canyon so when we got to the mouth of Todie canyon we were happy to find that its spring was running not far up its wash. Good campsite among the cottonwoods. 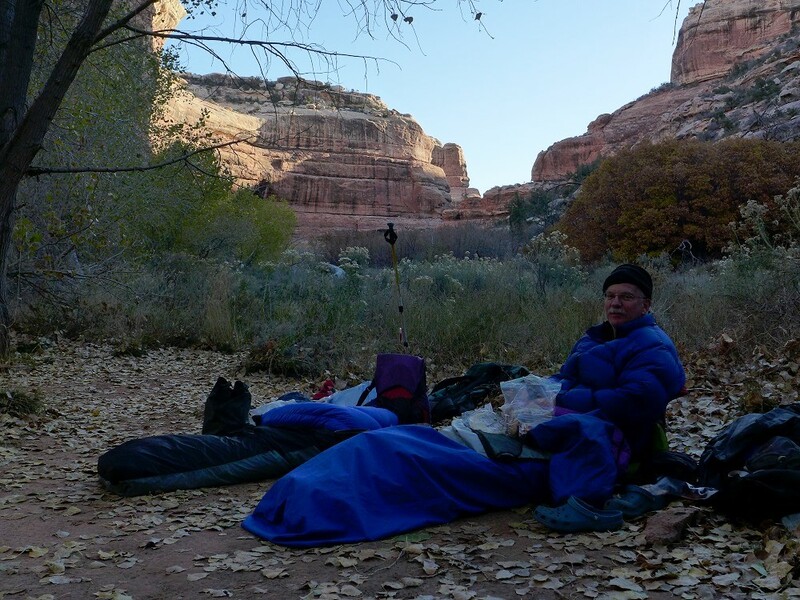 Woke to a clear morning, low 28.
with the occasional obscured way due to the flash floods this season both washing sections of the trail away and large amounts of debris washed up into the trees and brush. 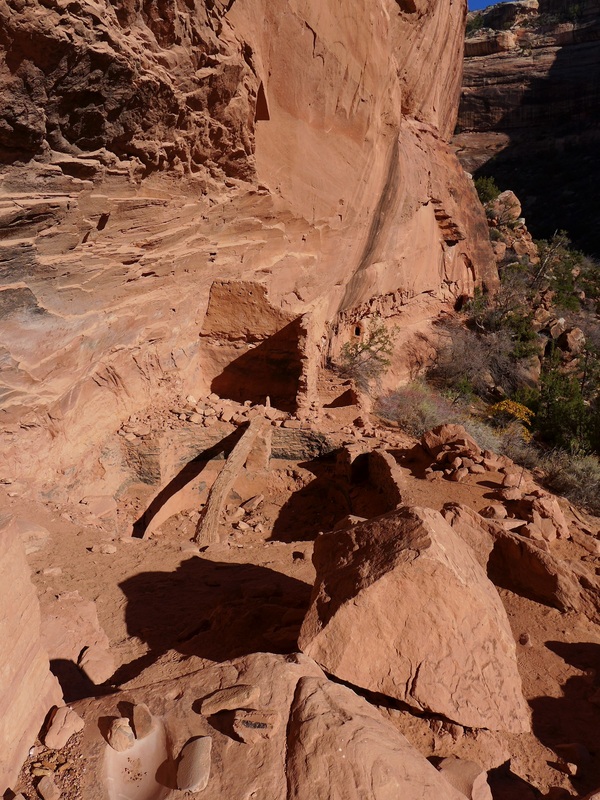 The trail in the upper canyon mostly cuts its way back and forth across the benches in the meanders. 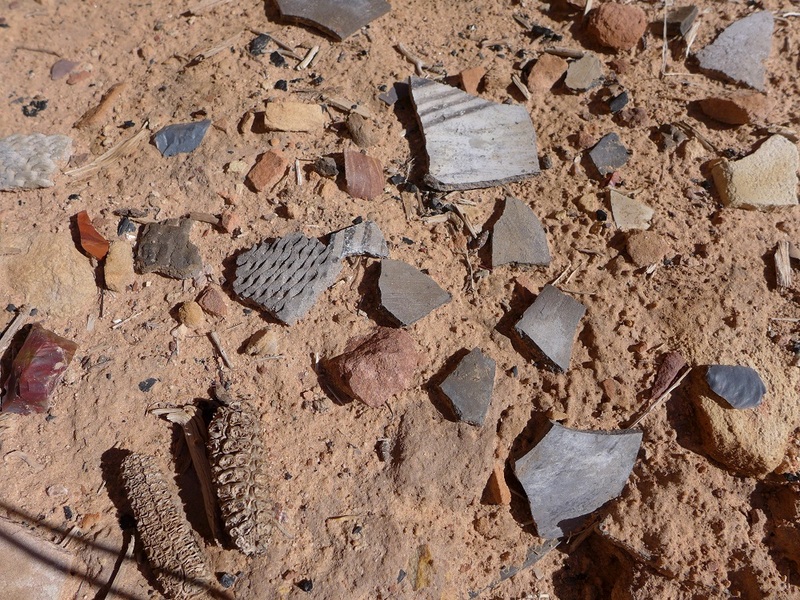 with its large midden full of potsherds, corn cobs and other artifacts. Less than an hour further brought us to Shelf ruin where we stopped for lunch as it began to cloud up. 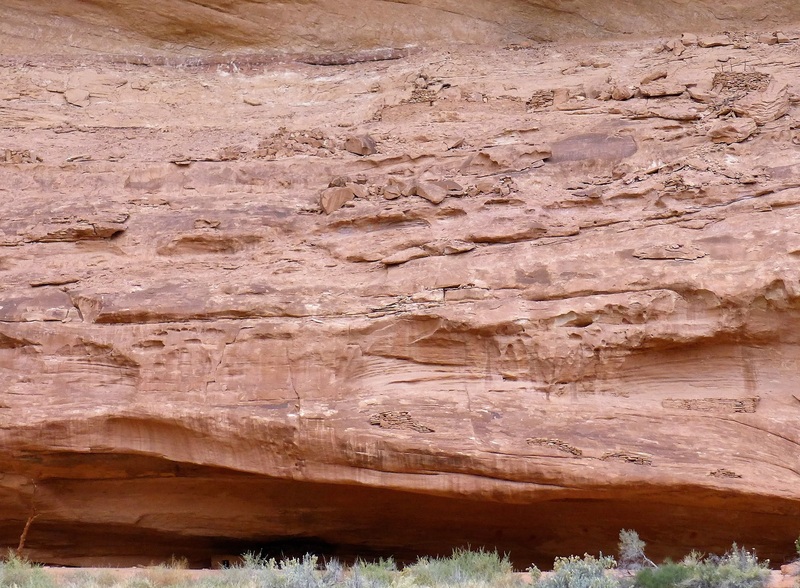 Look closely and you can see small structures all up and down the cliff face on the shelves. 1:30 and the wind begins to pick up and we decide it is time to head out. We knew that a strong cold front was to blow through today with maybe a 50% chance of precipitation. The first huge gusts of wind coming up canyon bent the cottonwoods and peeled off a lot of leaves. Ten minutes down canyon it began to rain with some hail mixed in, this is when the wheels began to come off. We had both brought rain jackets and I had thrown in some rain pants at the last minute mostly for the expected cold temperatures so we stopped and quickly pulled them on. 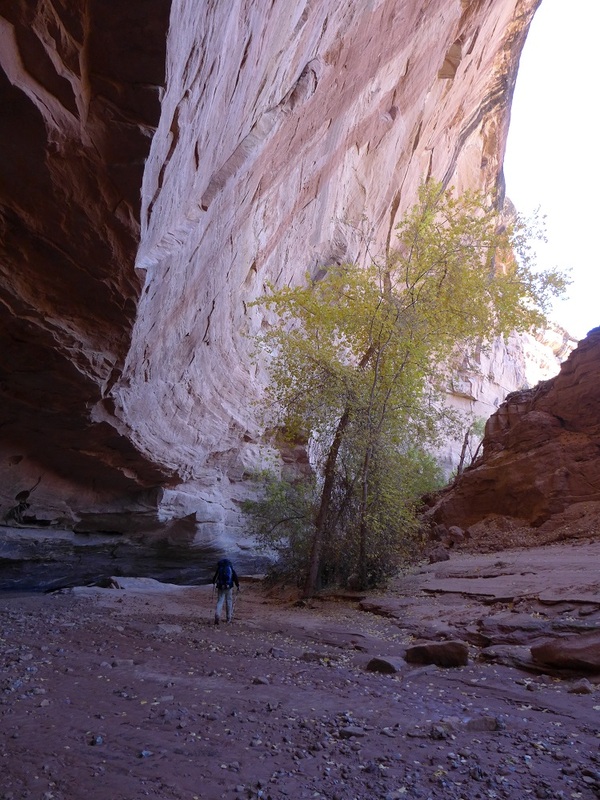 It began to come down harder and we stopped under a small overhang in the stream bed thinking it would be short lived. Waterfalls began to pour off the tops of the canyon walls as we waited. No sign of slowing down so we decided to head back up to Shelf ruin which was the only big alcove we had seen. After a few minutes it began to look like it was lightening up and it stopped raining. We looked at each other and turned back down canyon. 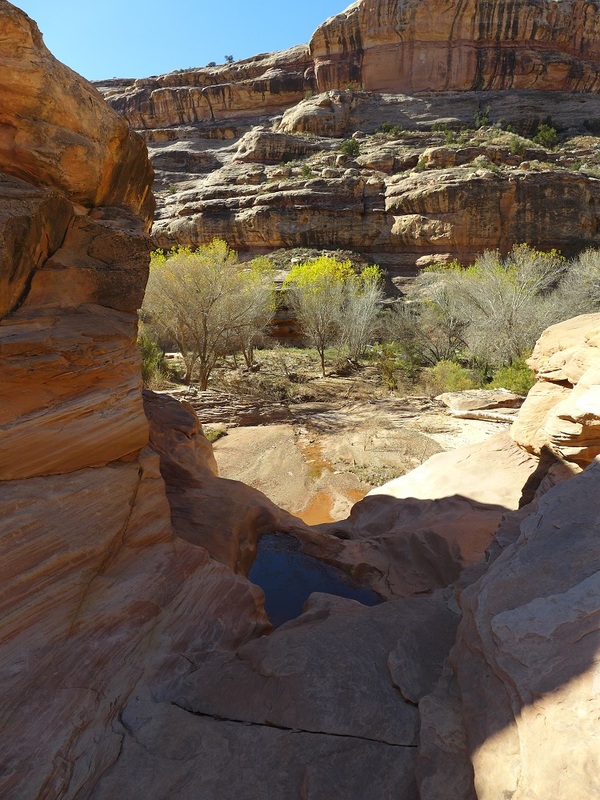 There was not much water in this section of the canyon so we were looking for both water and a good alcove to tuck under for the night if possible. After a bit the rain started again with some snow mixed in. Heads down and in the rain jacket hoods we moved down stream as fast as we could. 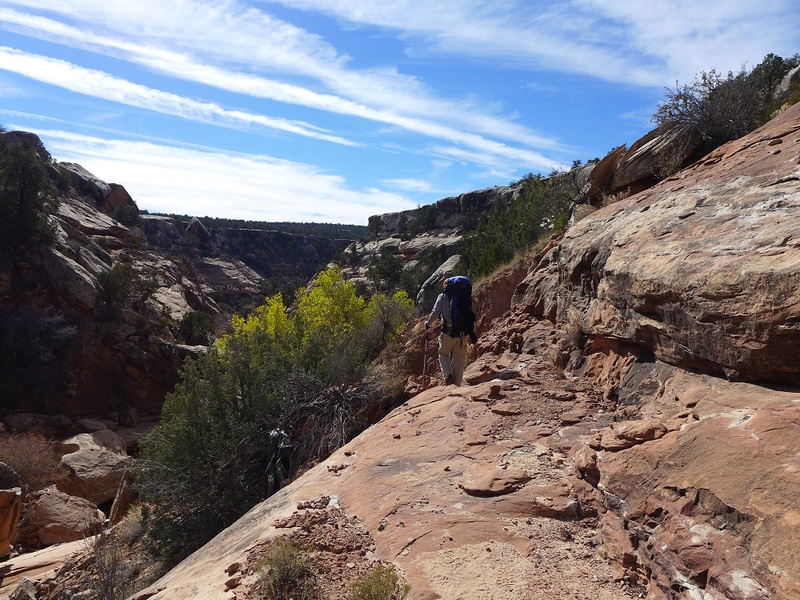 About 3:30 the first side canyon I had seen came in on the left, I said it must be Coyote canyon with a good spring so we dropped packs to go get water for the night. 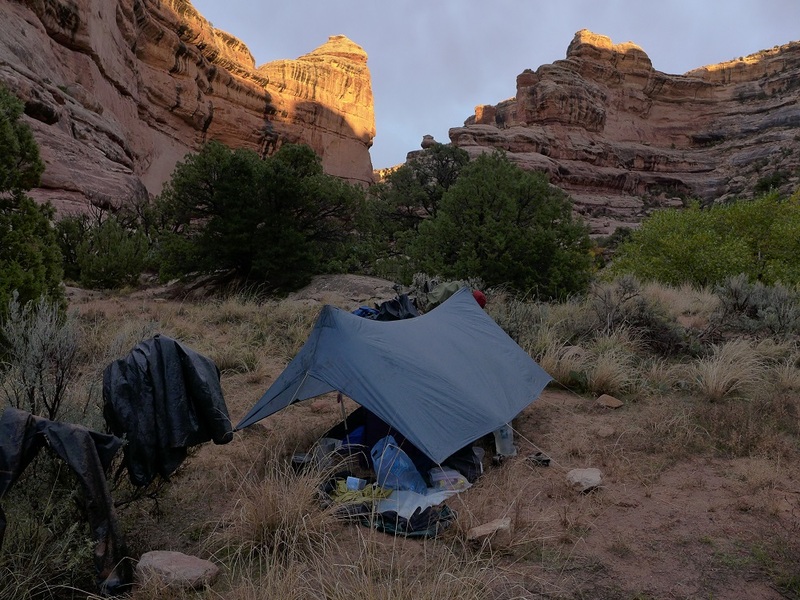 As we dipped up water it began to graupel hard, quickly turning the ground white, we had seen a pretty good campsite up on the bench above the wash and decided to just cut the day short and set up the tarp. As Scott said “nothing focuses the mind like hypothermia”. Classically just as soon as we had the tarp up it stopped precipitating and the sun peaked in and out. We got out of our wet clothes and into the sleeping bags, warm and dry we had a good evening. It was windy and blew fine snow off and on until about 1:00 a.m. and then finally cleared off and we woke to a beautiful morning, 30 degrees. While having breakfast we were startled by a big rock fall just up the canyon behind us, we were safe but it was really loud. 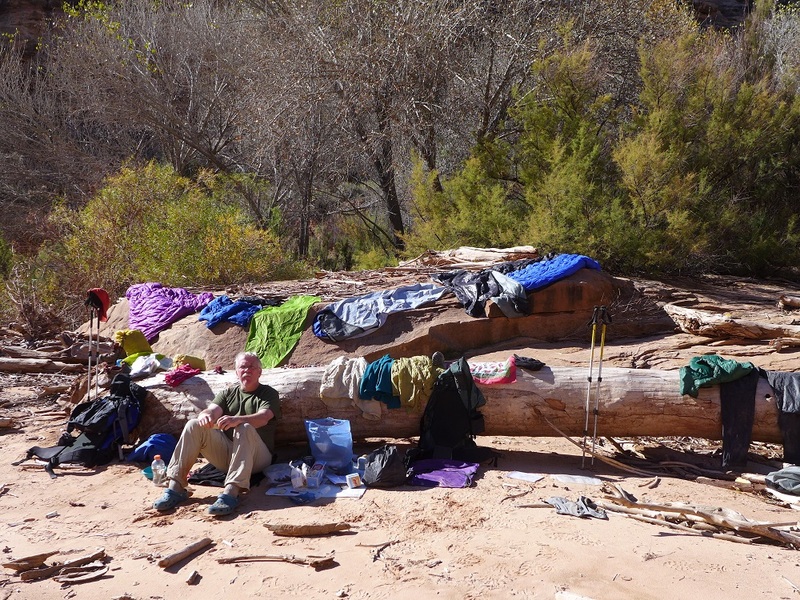 We waited until the sun hit the camp so we could dry a few things and didn’t hit the trail until 10:00. More water in the wash now and it stayed that way most of the rest of the trip. In the shade things were still frozen with the remains of yesterday’s storm still on the ground. We passed this ruin about a half an hour downstream but by now we were beginning to thrash through the tamarisks that line the wash so only got a shot of it through the brush. 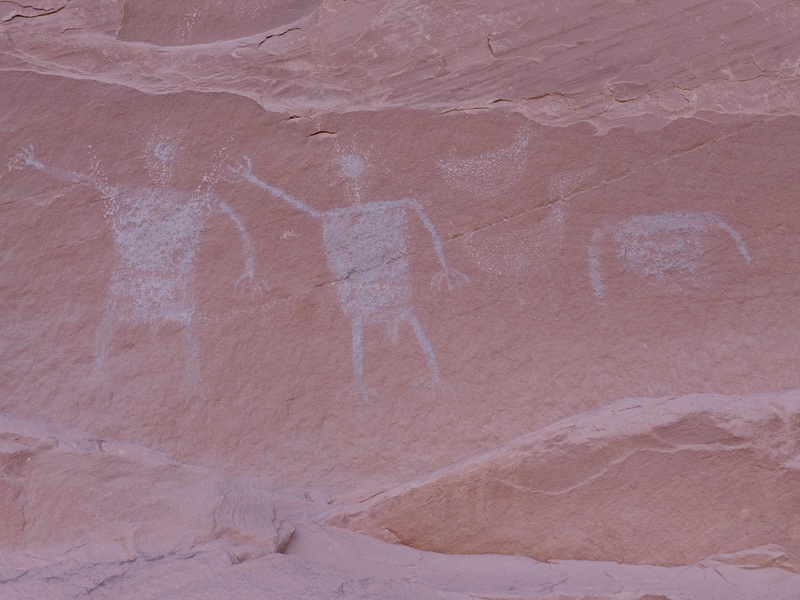 After an hour the first side canyon came in on the left and we dropped packs thinking this was Sheiks canyon that has a great rock art panel not far inside it including the Green Mask. We walk a half an hour upstream to a big pouroff and cannot find the panel. 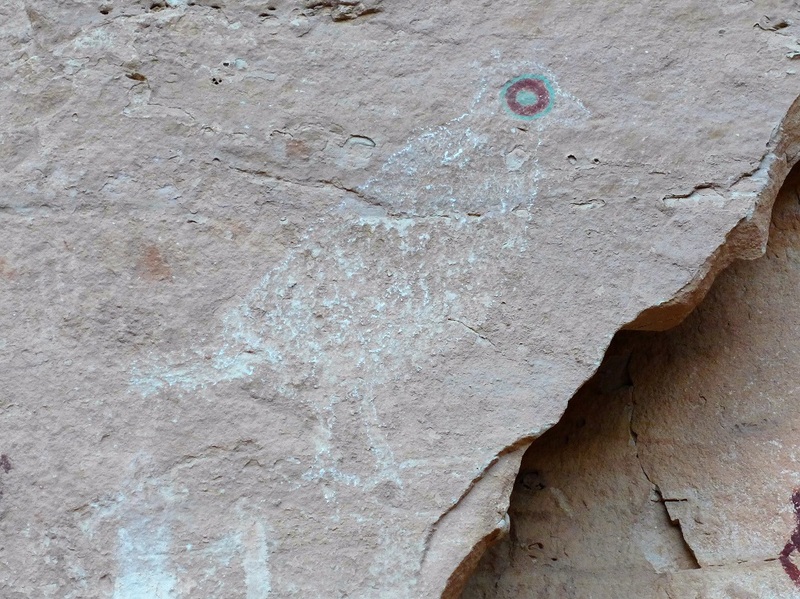 We do see a petroglyph panel way up high on a wall but no painted pictographs. 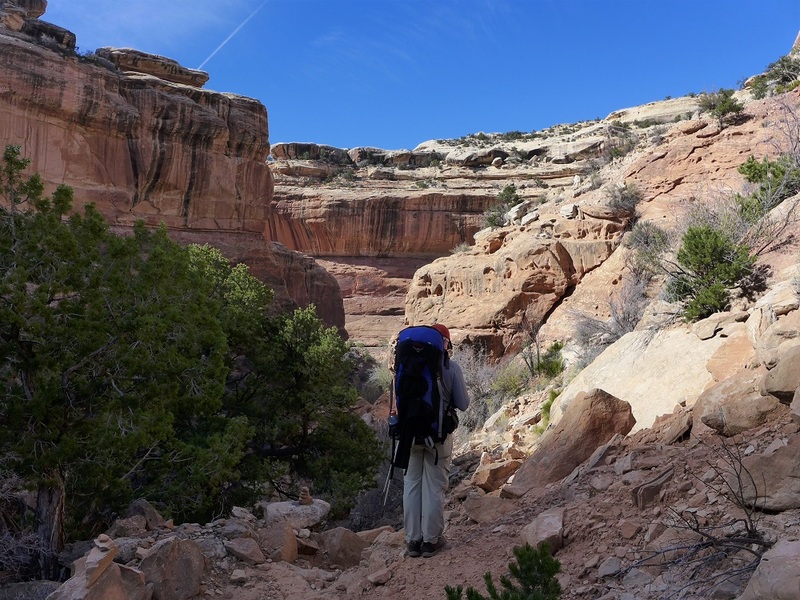 We give up and head back to the packs by noon and then begin to fight our way down canyon through the brush with lots of steep descents and climbs back out of the sandy wash. About 1:00 we come across a group of Canadians having lunch who are headed up canyon. 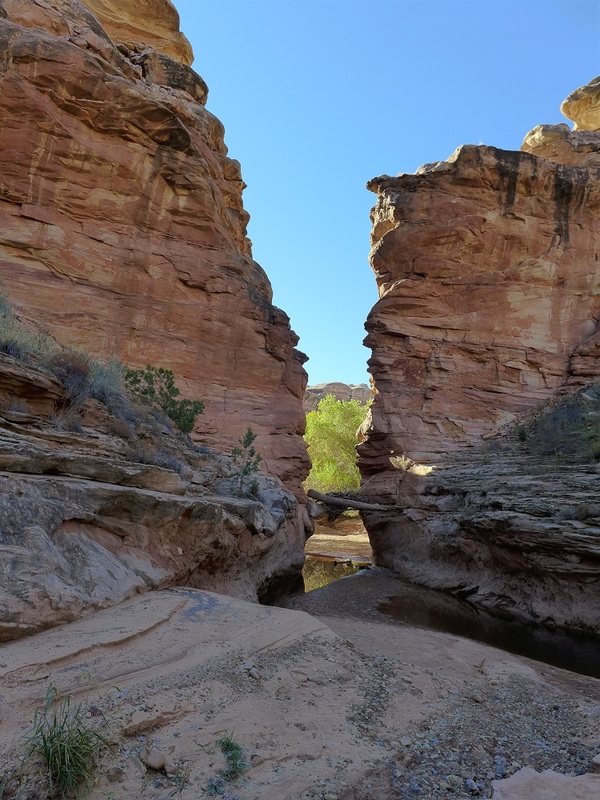 We head on down canyon looking for the mouth of Bullet canyon, its spring and a place for lunch. At 1:30 we find a sunny spot and stop to eat. Shortly after we get going again a canyon appears to open on our left as Bullet should. 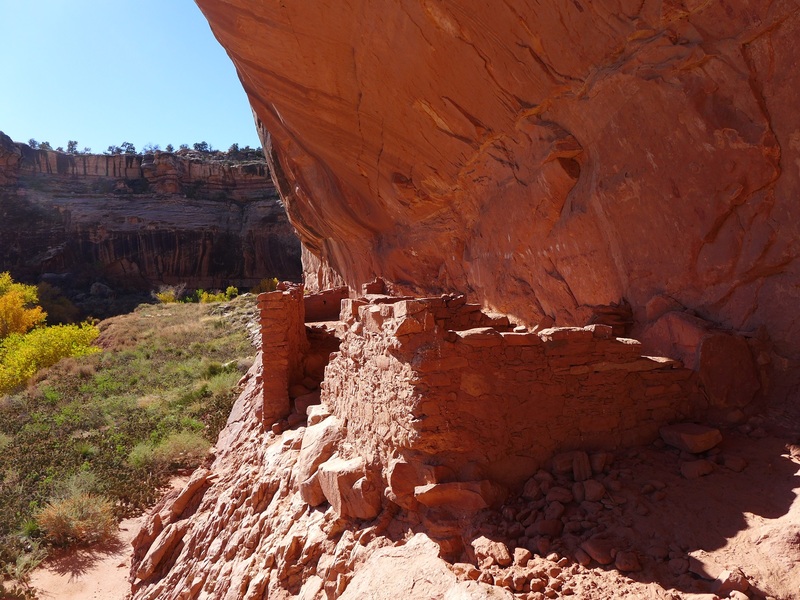 Our original plan was to camp here last night and then day hike up Bullet this morning to see Jailhouse and Perfect Kiva ruins and then head a few miles down canyon for tonight. Because we stopped short last night and took extra time this morning to dry things we had decided to skip going up Bullet and just head on down to Step Canyon for the night. We drop packs to go get water and I realize the water is flowing the opposite direction from the way I thought it should be. I scratch my head, I am temporarily misplaced. I pull out the little gps/data logger I carry and it is giving me all kinds of strange readings deep in this brush filled hole. We know that we need to follow the water down canyon so we pull the packs back on and continue on sure that we will figure it out. Crashing through the brush, down and up across the wash many times, trying to catch glimpses of something that would give us an idea of where in the canyon we were, it is tough going, between 1 and 1.5 mph. At one wash crossing I snap the bottom off one of my poles. Two hours later we hear some voices, we don’t want to have them pass us in the brush and not ask where we might be. 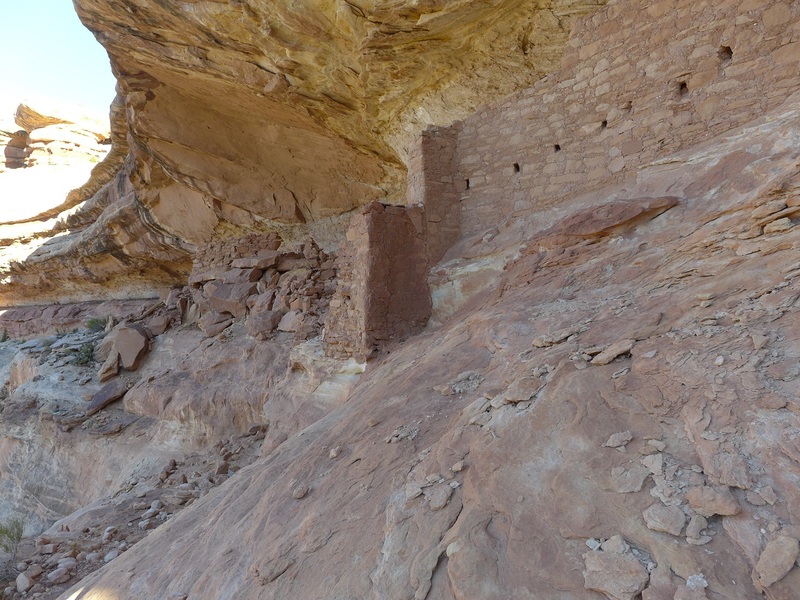 We also spot a ruin high on the wall that looks like Two Story ruin. The voices are up on the bench near the ruin, they are photographing it. I ask “is this Two Story ruin?”. They reply “don’t know but it looks like one”. 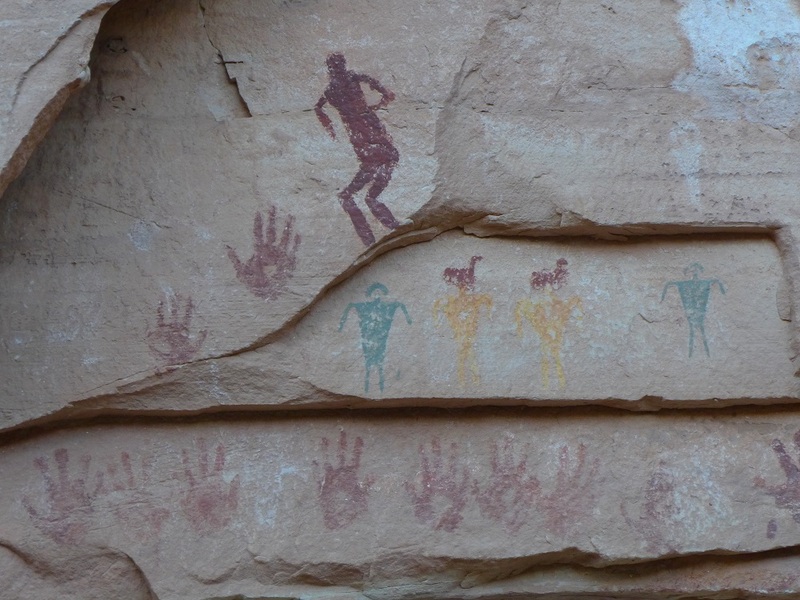 I ask “how far is Step Canyon?’ They say “the one with the big rock art panel?”. “Yes that is the one” I reply. “Oh it is just around the corner”. Awesome! Not only do we know where we are but we are right where I wanted to be for the night! 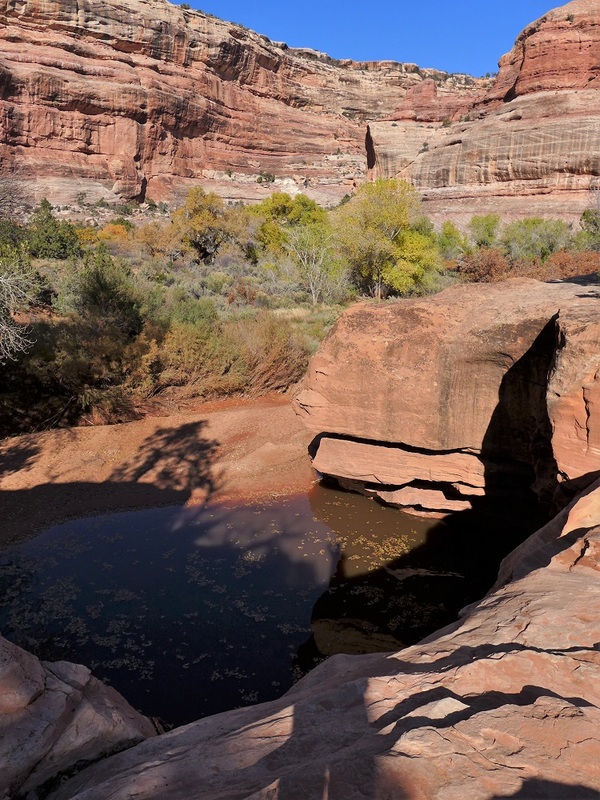 Five minutes later the Step canyon wash comes in from the right with a strong clear stream flowing. 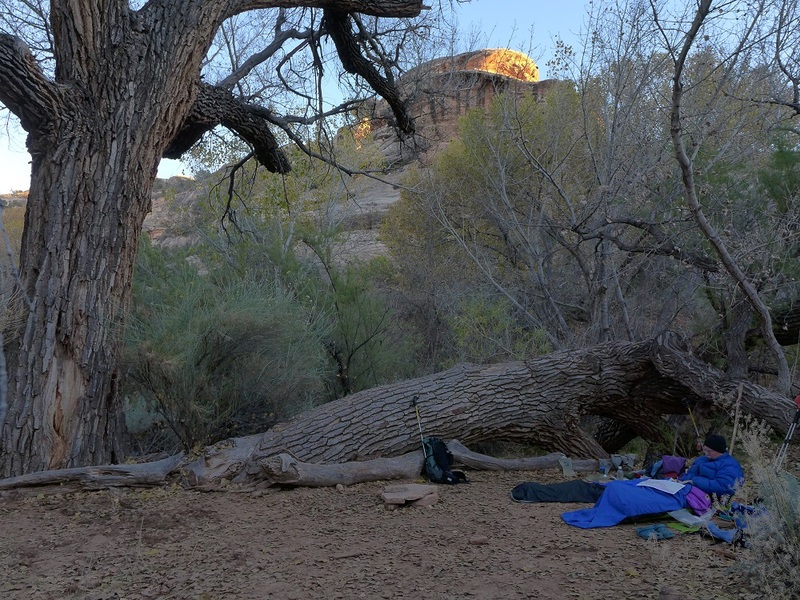 We fill up water for the next day and then climb up on to the rock shelf and find a great campsite on the slickrock. 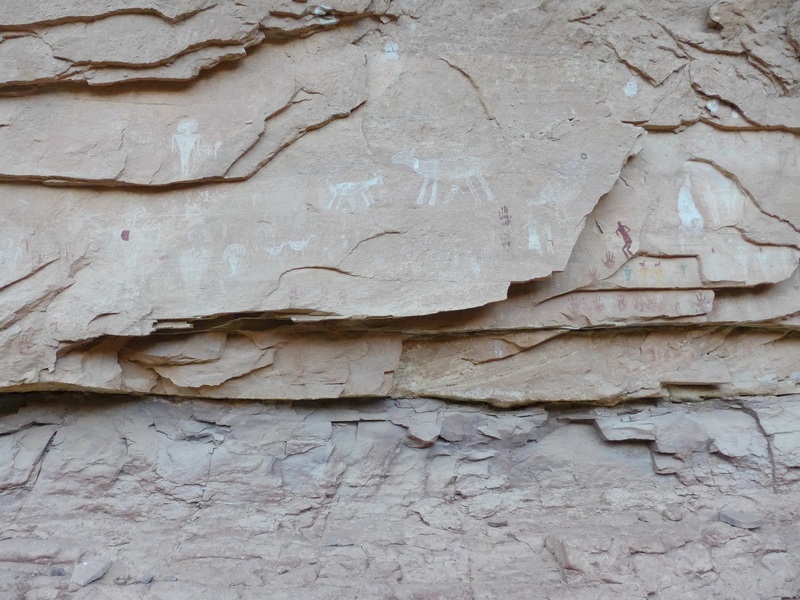 I walk around the rock shelf into the mouth of the canyon and find the big rock art panel and take some pictures. We will take more time exploring it in the morning. Great dinner and night of incredible stars. 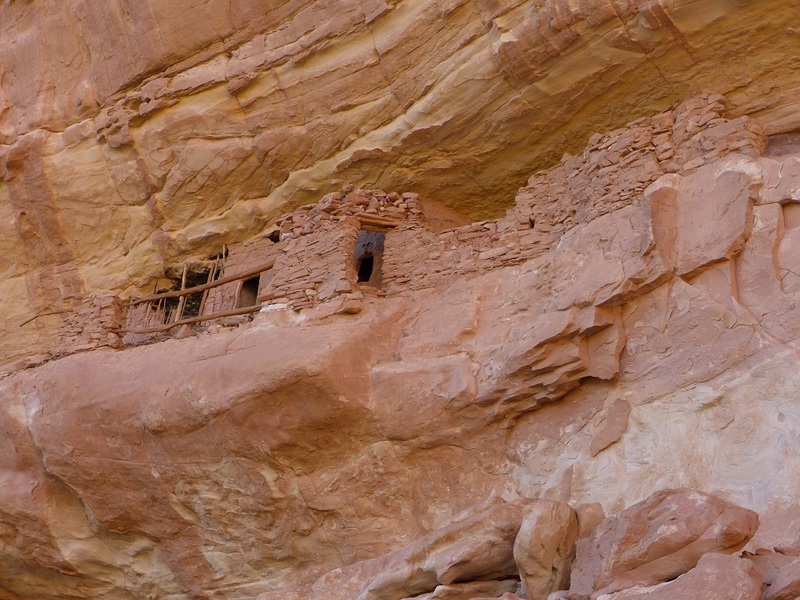 We are tired from both the tamarisk thrashing and the mental strain of trying to figure out where we were but buoyed by now being where we should be. In hindsight here is how we got misplaced. 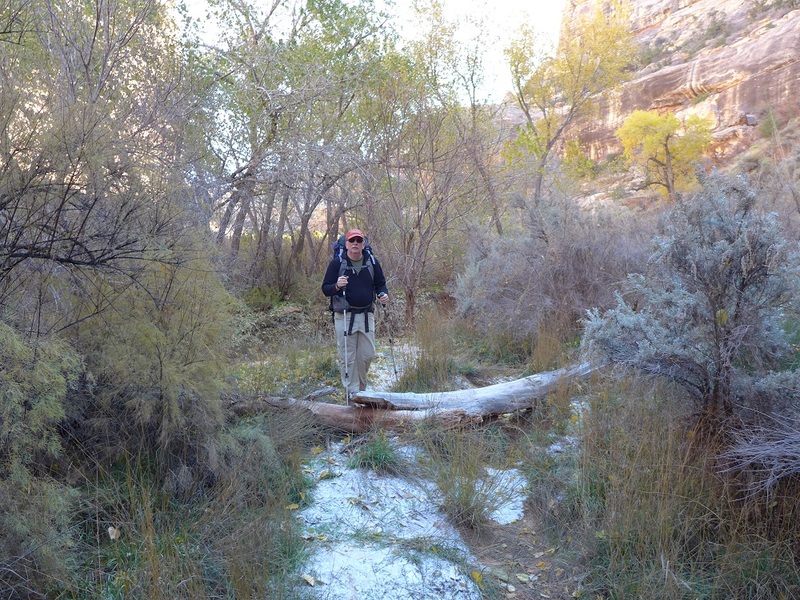 In the rain and snow the day before we trudged right past Coyote canyon and ended up at Sheiks canyon. The next canyon down, in the morning, was not Sheiks but Bullet which is why we couldn’t find the Green Mask panel. We had actually camped just around the corner from it the night before! Looking at the map close and comparing pictures and times it was obvious that we had walked up Bullet and that the ruin we passed first thing in the morning was actually Castle ruin. The place we stopped for water and realized it was flowing the wrong direction was probably Greenhouse canyon which is the first canyon coming in from the right after Bullet. All of this made more difficult by the hard and obscured travel through the brush filled canyon. Walking by 9:30 we thrash through more tamarisk but after about a mile it begins to open up more and we can take to the wash for the most part. While we are taking a short break a lone hiker comes charging up the wash carrying on about having to get away from the big llama packing group he has been with. Just around the corner we run into them near the mouth of Dripping canyon, 6 llamas and maybe 10 people, they are headed up stream to Bullet canyon for a few nights then back down canyon and out the Government trail. 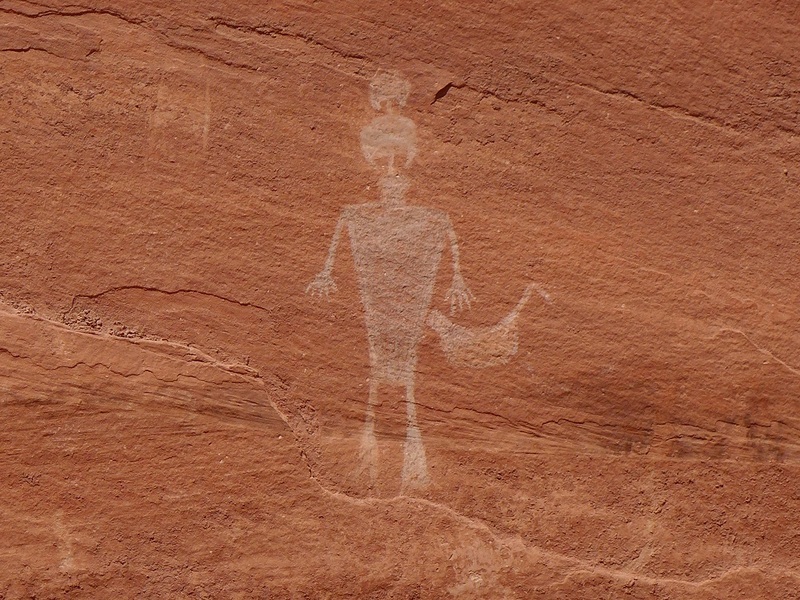 Soon we come to Cow Tank canyon and drop packs to go up and find a rock art panel called Dead Spar Knoll?, not far up canyon in another huge alcove. Anthropomorphs, birds and a garden rake looking item. We head on down canyon and when we come around a corner and the Bird Parade panel is high up on the wall. There must have been a lot of quail in the past. 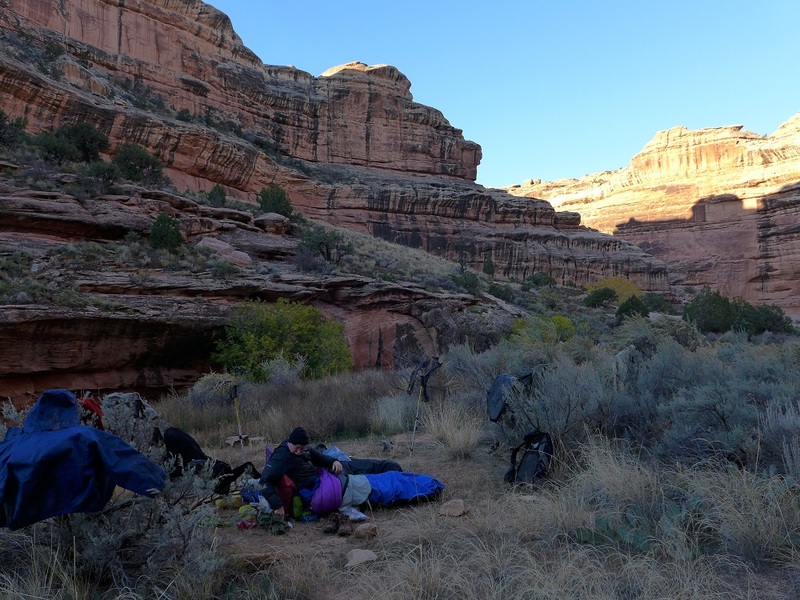 We come upon a NOLS group having lunch, they have been out for a month and are headed up canyon to Kane Gulch. This was the section of canyon we should have not seen anyone and now at least 20 people in the last two days. Looking for a place for lunch we come to Long House ruin. After lunch it is a short distance downstream to Big Man panel and its huge anthropomorphs that you can see from some distance coming down canyon. 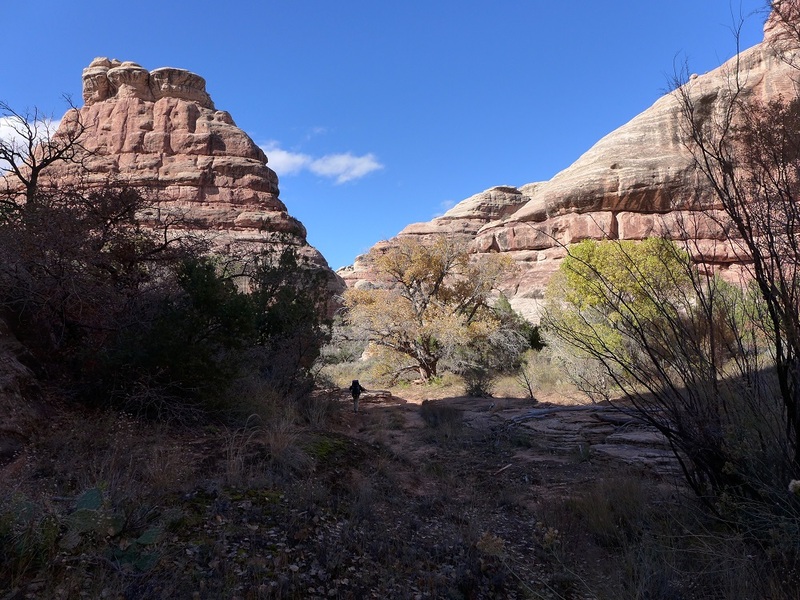 About a mile and a half below Big Man is Polly’s Island, an abandoned meander in the middle of the canyon. 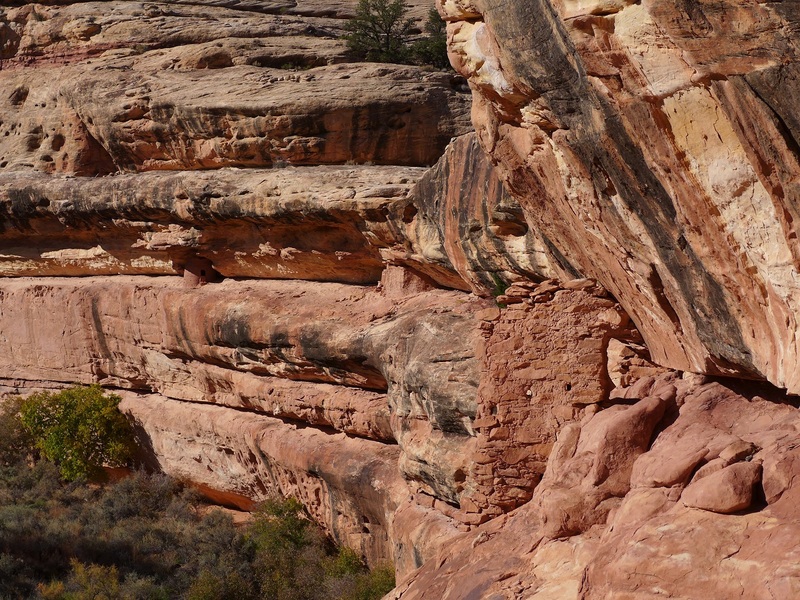 It is also where the Government Trail comes down from the east rim. 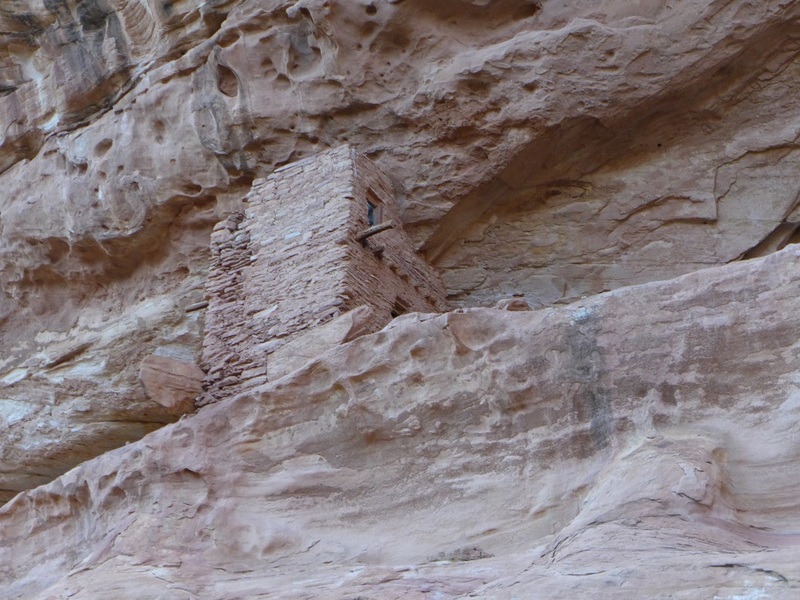 There is a fair sized cliff dwelling up on the east side of the island but I don’t see an easy way to get to it. 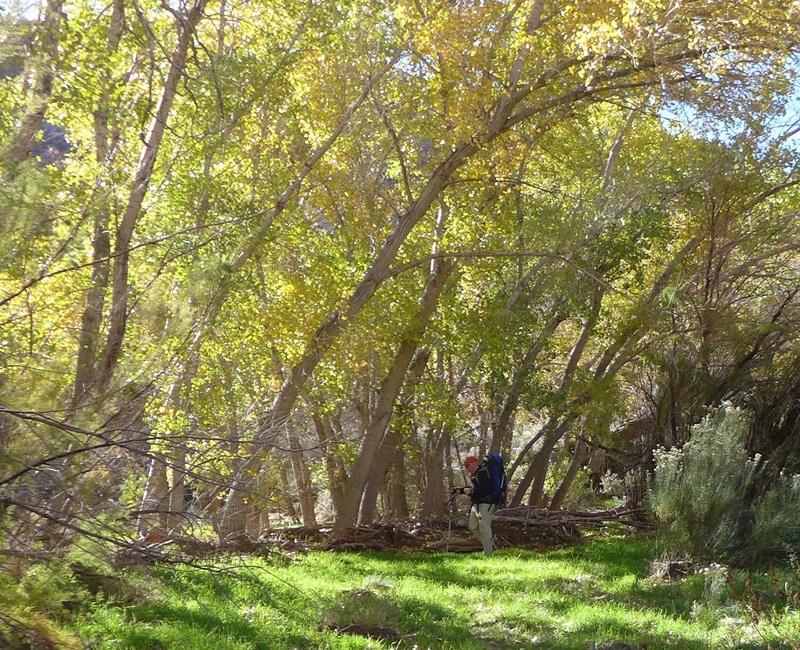 A good spring is not far up Polly’s canyon and a big campsite under a huge cottonwood tree is at the confluence. We settle in for the night. 24 degrees, the coldest of the trip but clear as a bell. 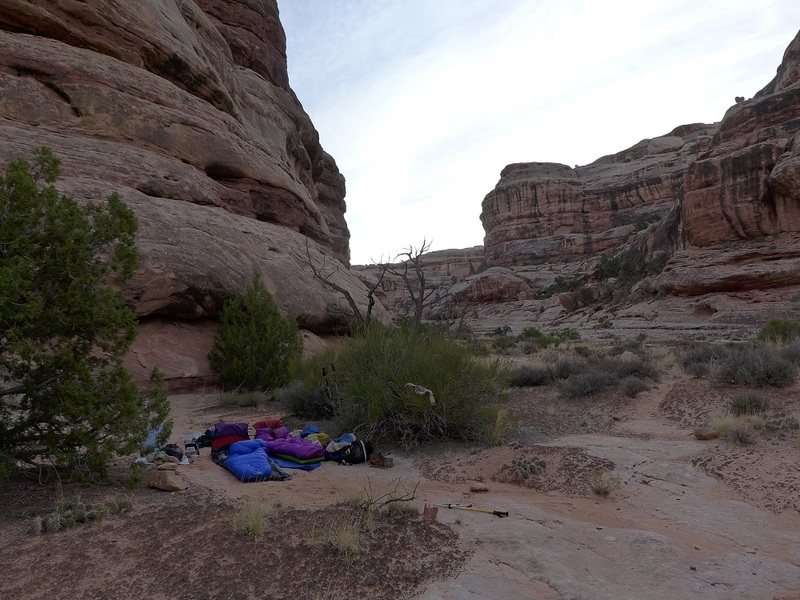 I figured this low lying campsite at the confluence of two large canyons would get cold and it was so. Walking by 8:30, still 26 degrees and we are headed towards some sun. 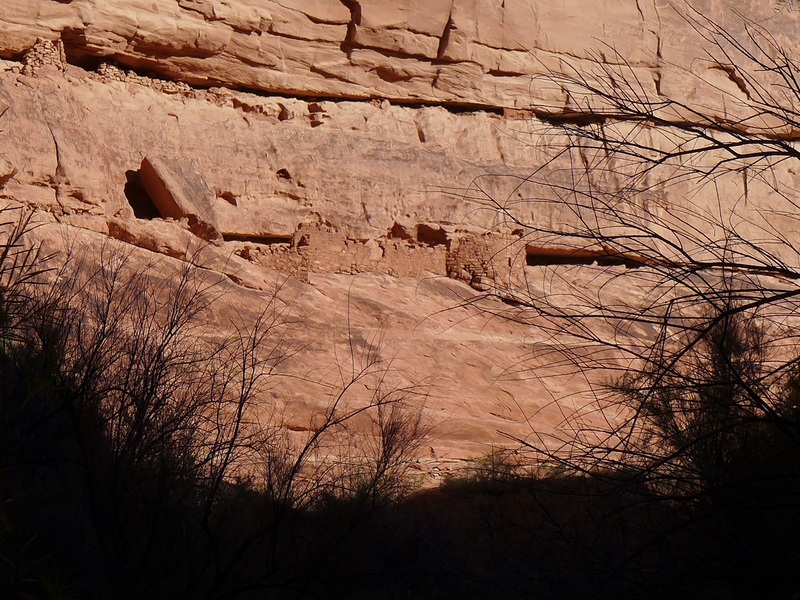 About 45 minutes down canyon we see a big ruin in a north facing alcove, unusual. I climb up to it and it is Fortress ruin, spread out across the shelf, you can see the holes for shooting arrows through. Thirty minutes further on we find the big petroglyph panel some people call the “Railroad” panel. An amazing huge expanse with lots of figures. You can see the figure that looks like a locomotive that gives it the name. We are on a roll now and in another 30 minutes we come to Round House ruin spread out across a shelf that I could climb up to. The round house itself is on the far left with a bigger rounded structure in the middle and the guard house with arrow holes pointed right down the shelf. We take a long lunch and spread out in a full yard sale to air and dry out things. We fill up with 6 quarts of water each as this is usually the last reliable water from here on down. 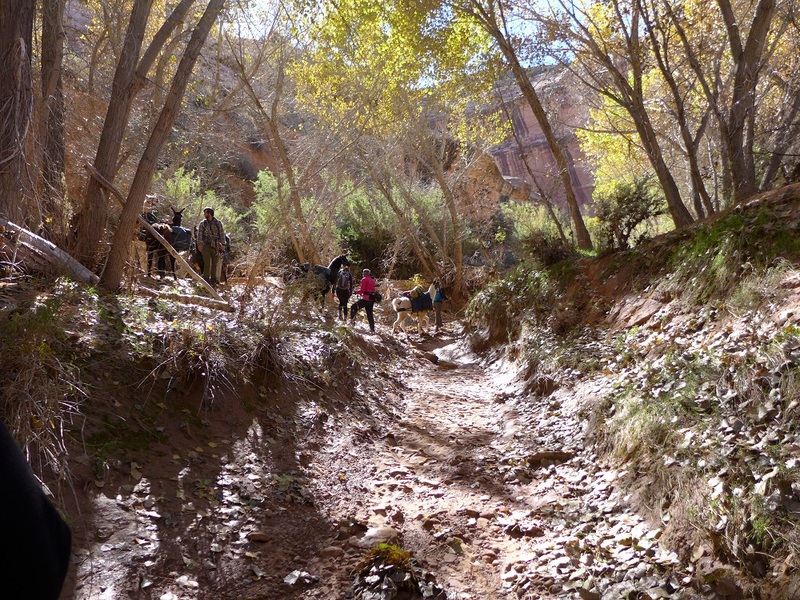 Turns out we didn’t need to bother as there was water flowing almost all the way down to Collins canyon. 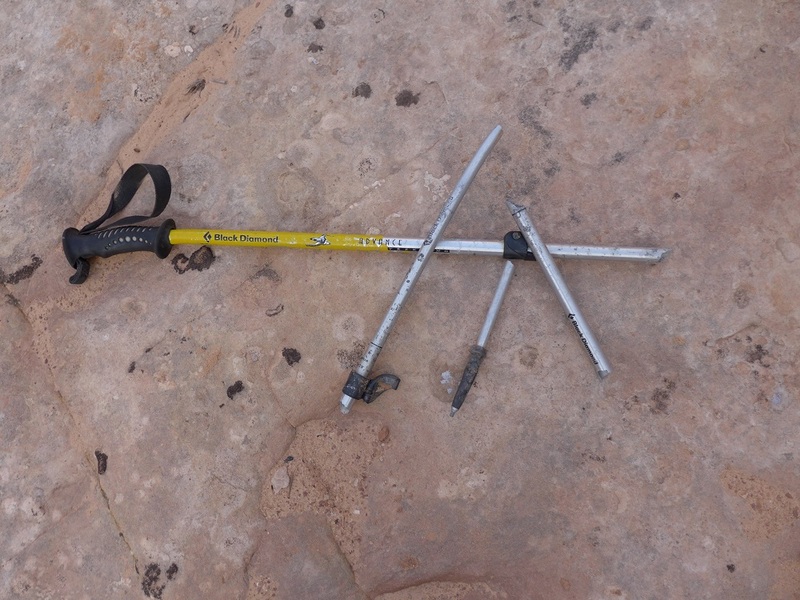 At one jump across the water I broke one of my poles again, this time I could duct tape it to hold it together. 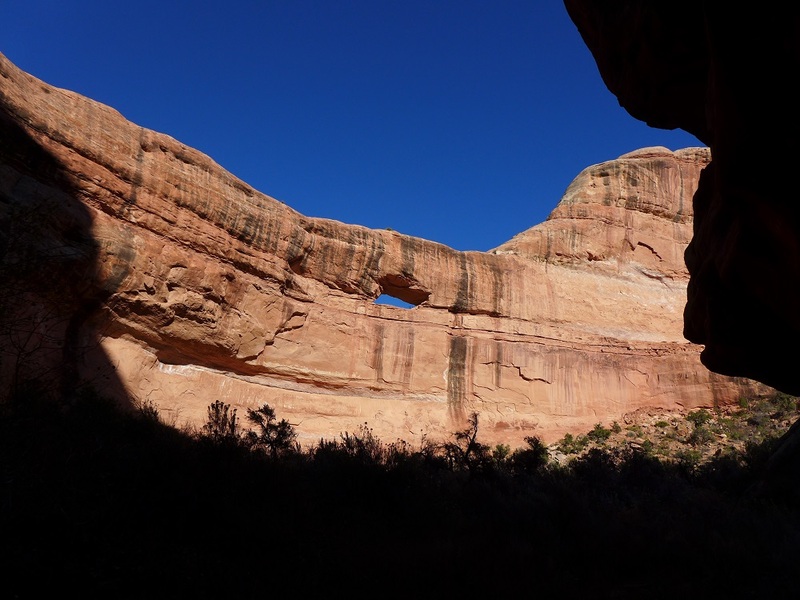 It was about two hours until we got to Bannister ruin, named for the unusual double log railing. 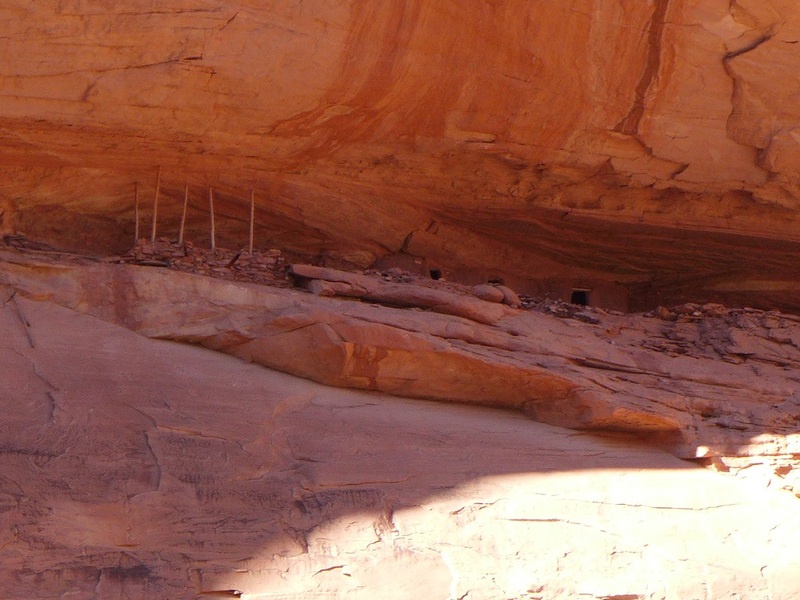 The kiva is down on the lower level and seems to be intact. 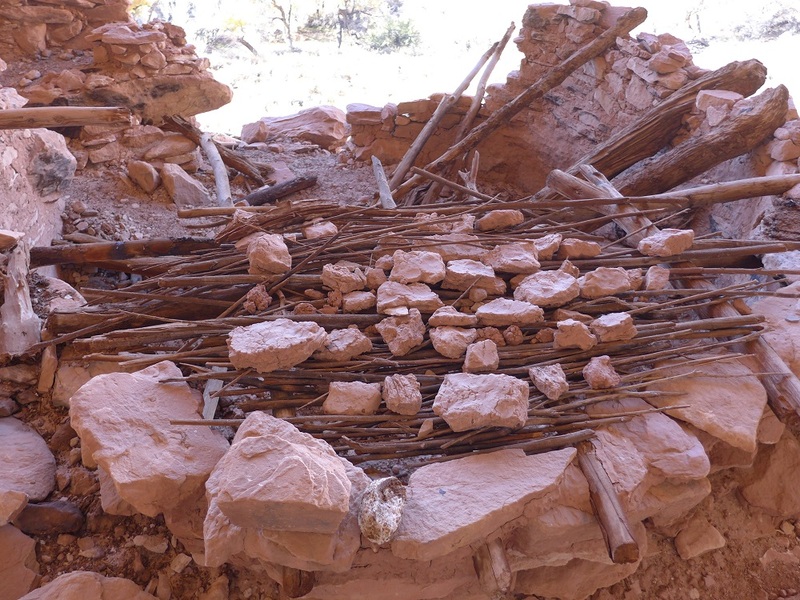 The BLM has cordoned off many parts of various ruins in an attempt to keep people out, you can see the stands and chains around the kiva. 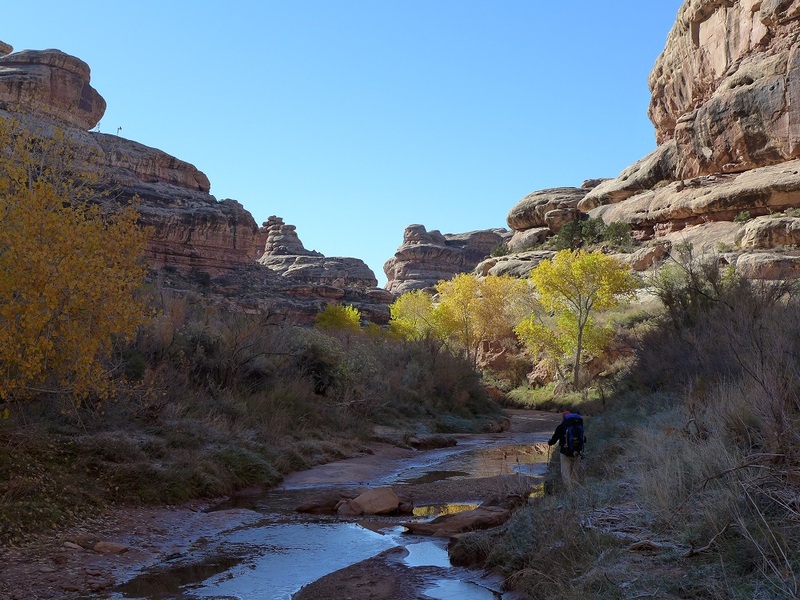 We had planned to camp just downstream from Bannister but as it was early we decided to add a few more miles on to the day so that tomorrow we could carry the packs a shorter distance and then day hike the rest. 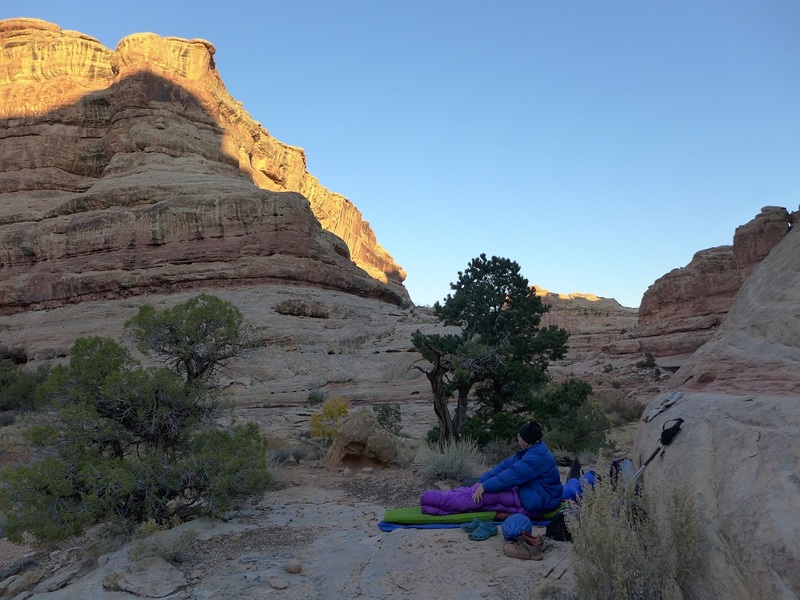 We made it down to the next abandoned meander just before Collins canyon and found another great campsite up on the slickrock. 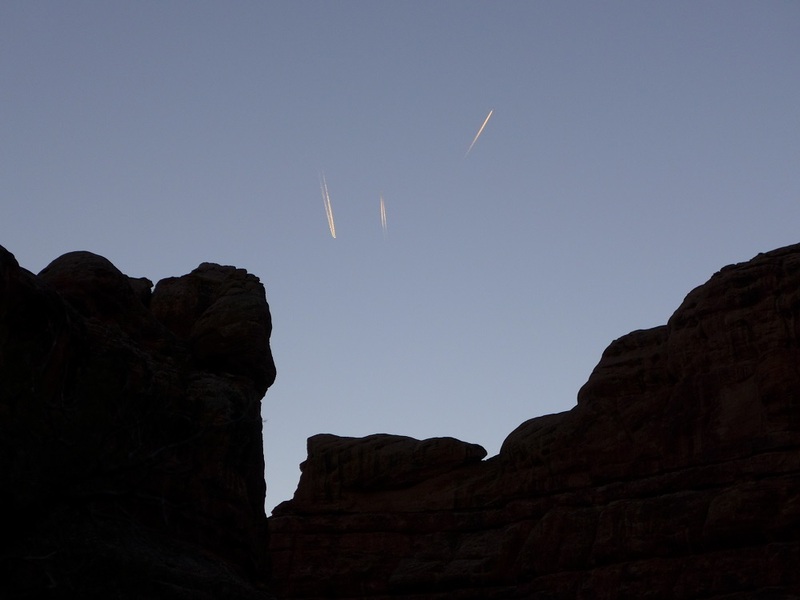 32 degrees and much warmer up on the slickrock than down near the wash.
One of the less desirable things about Southern Utah is that it is on the flight path for a huge number of planes, you almost never see less than 3-5 planes at any time. We are off towards the Narrows, Collins canyon opening straight ahead where we will be exiting tomorrow, ice on the water. Quickly to the Narrows and we can walk through without taking our shoes off. 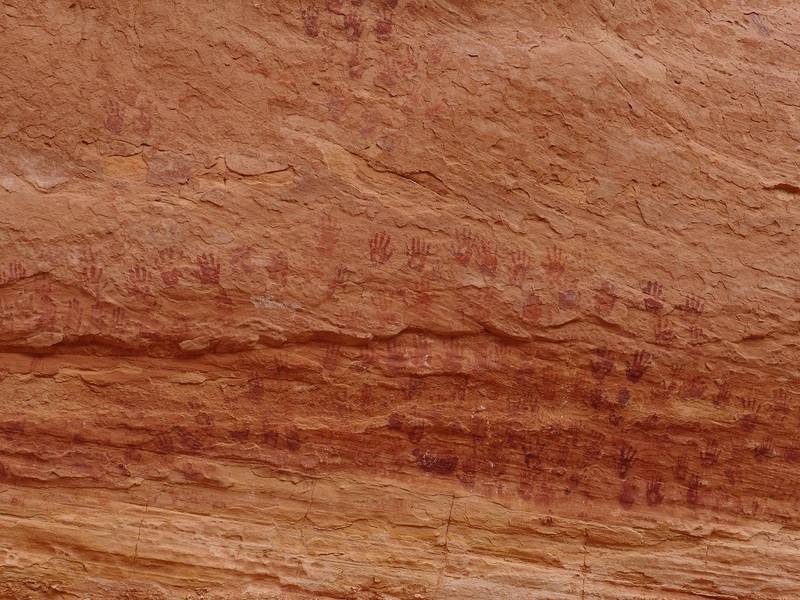 We drop packs and climb up just to the right on the downstream side of the Narrows to find “Holding Hands” panel, quite distinct. As we return to the packs a couple from Alaska is day hiking down from the Collins Spring trailhead and we spend some time visiting with them before moving on down canyon. About an hour down we find the 100 hands panel, hard to see in the direct sun, we will see it again heading out tomorrow. 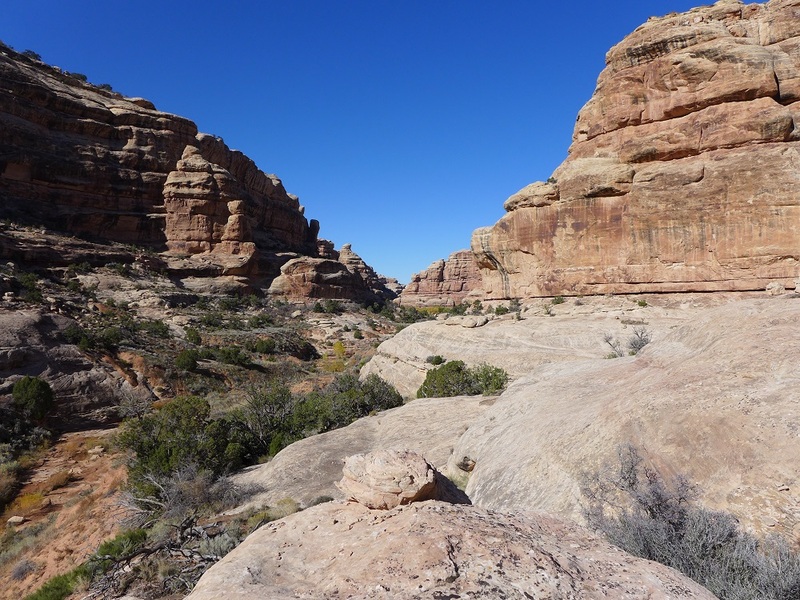 We move 5 minutes down canyon and find a good spot up on the slickrock for lunch and camp. While we are having lunch another couple comes by looking for Bannister ruin, we crush their spirits telling them that it is the other way and about 5 miles. 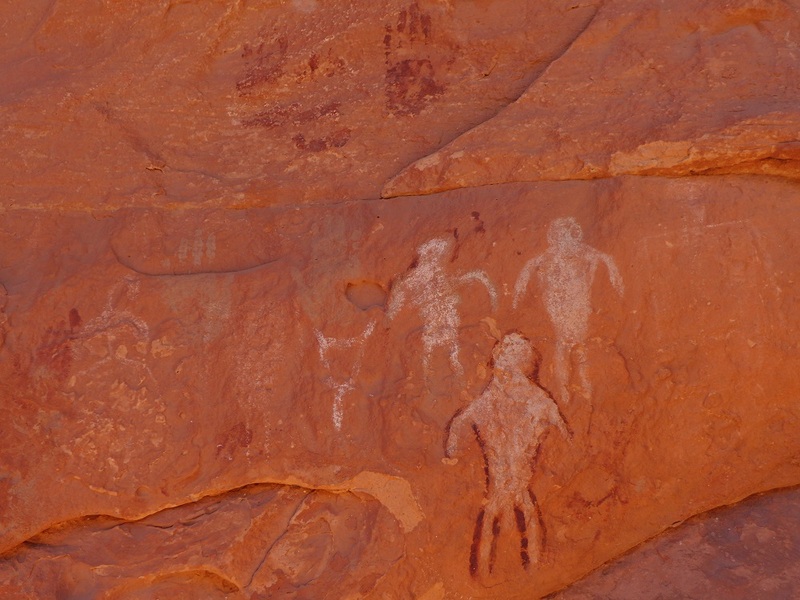 At 1:00 we grab the day pack and head down to find the big rock art panels. 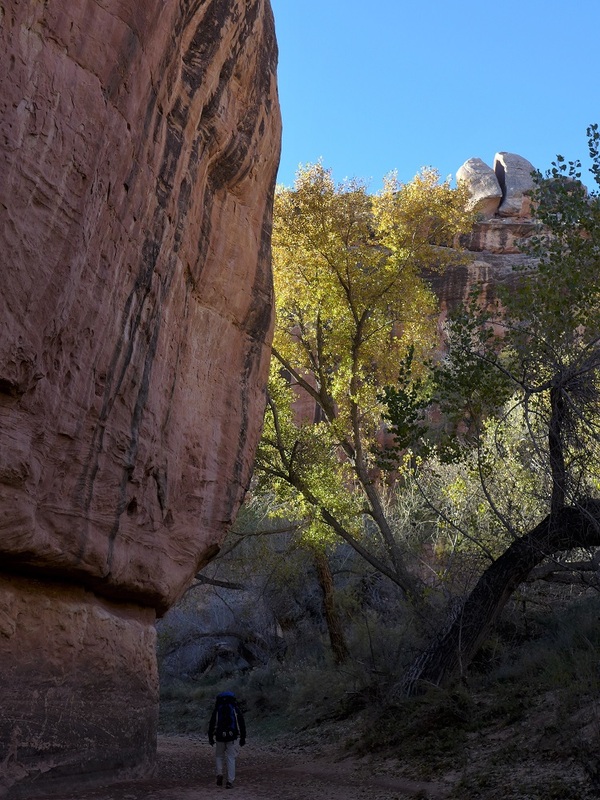 The biggest panels in Grand Gulch are about 4 miles below Collins canyon and we have just over 4 hours of daylight left and at least two miles to go. We said we would turn around at 3:00. Some slow going, especially avoiding the wet and sometimes quicksandy areas. We spot a few granaries and one smaller all white panel way up high. 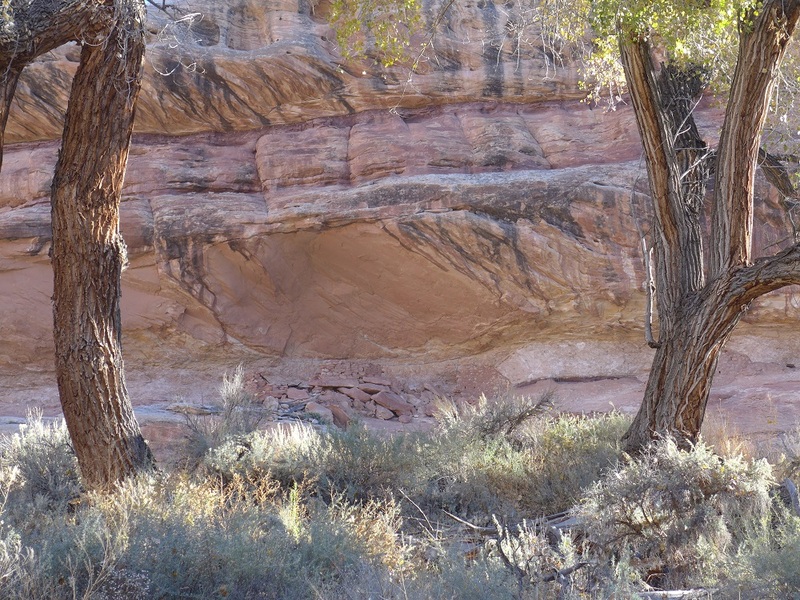 In this section Scott saw a Desert Bighorn sheep running across a bench in front of us. About an hour and a half down we spot what some folks call Red, White and Blue panel and others call Big Panel #2. 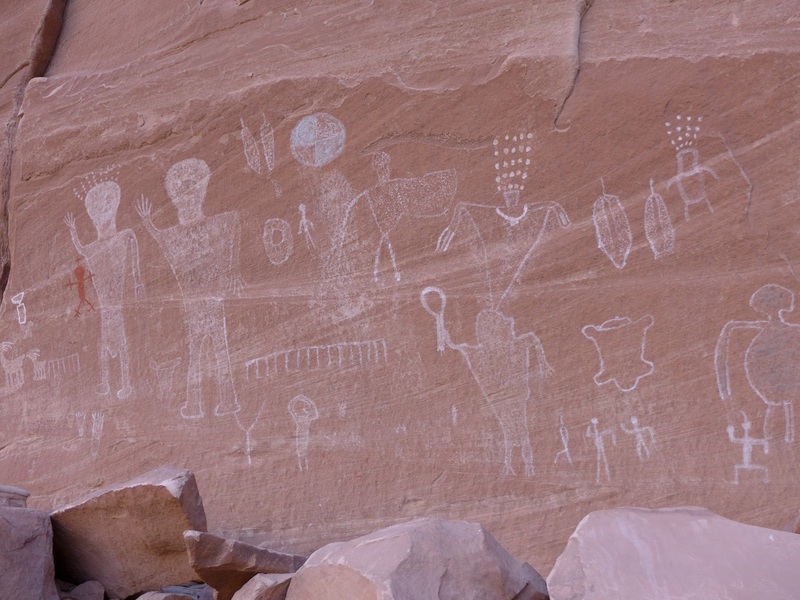 It is a big panel with lots of white figures and one green, one yellow and a few red ones. I could get to it only by doing a belly crawl across a ledge but decide not to and to save the time for the Big Panel on down canyon. Less than ten minutes downstream you can see Big Panel way high up in an alcove. We find a way to climb up to it using a pile of stones people have stacked up to get onto the shelf. It is a huge panel, a hundred feet or longer. Hard to get a picture of but here is a panorama of the main section. Scott is getting antsy with the time so about 3:15 we head back towards camp. 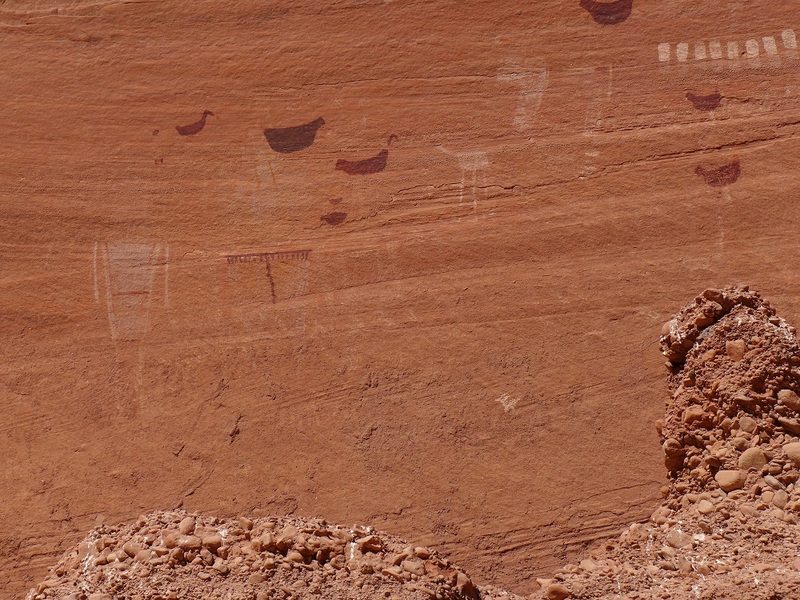 We fly back up the canyon but also get to appreciate the canyon itself without always looking for ruins and rock art. On one very steep climb up a sand bank I break yet another pole section and now I am down to one full pole and one in four pieces. 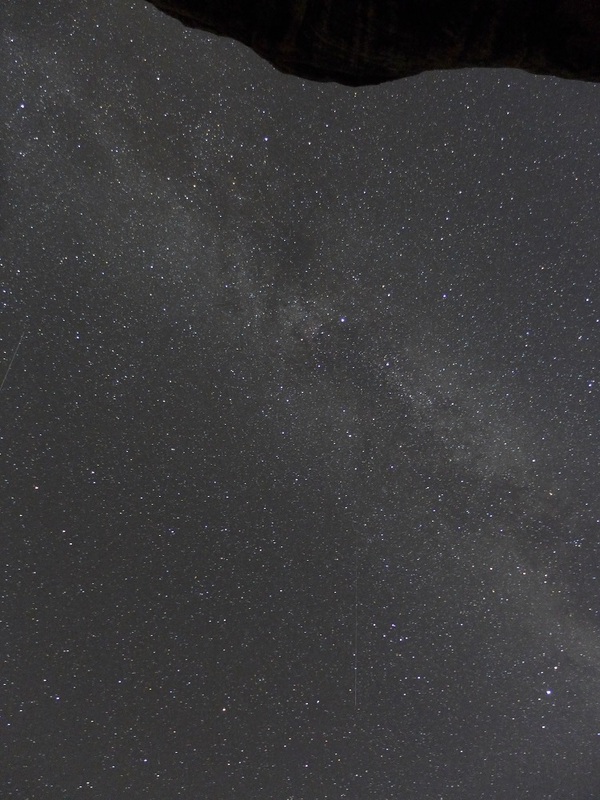 Back to camp in an hour and we settle in for one last big meal and star watching. Only 33 degrees but it is beginning to cloud up with the approach of the next front. Looks like we will get out just in time. Walking by 8:30 we only have about 4 miles to the car. We take the time to stop at 100 hands panel, now in the shade with much better visibility. Back to the Narrows in 45 minutes and then on up Collins canyon. We pass two guys who are heading up canyon all the way to Kane, I would not want to do the brutal bushwacking from Dripping canyon to Bullet going against the grain. We wish them well and they are mostly worried about potential precipitation. Finally we see the cars at the trailhead and just then a huge buck deer ran across the canyon before us. We hit the car at 10:30, the walking part of the trip is over. One last look down Collins canyon as the front begins to roll in. 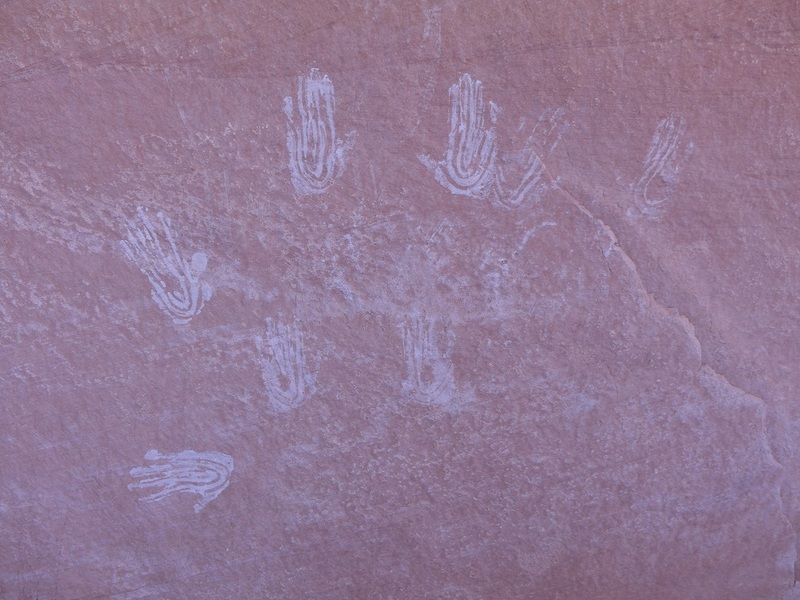 Because we have the time and the opportunity we drive down to the very end of Cedar Mesa and out to Muley Point. 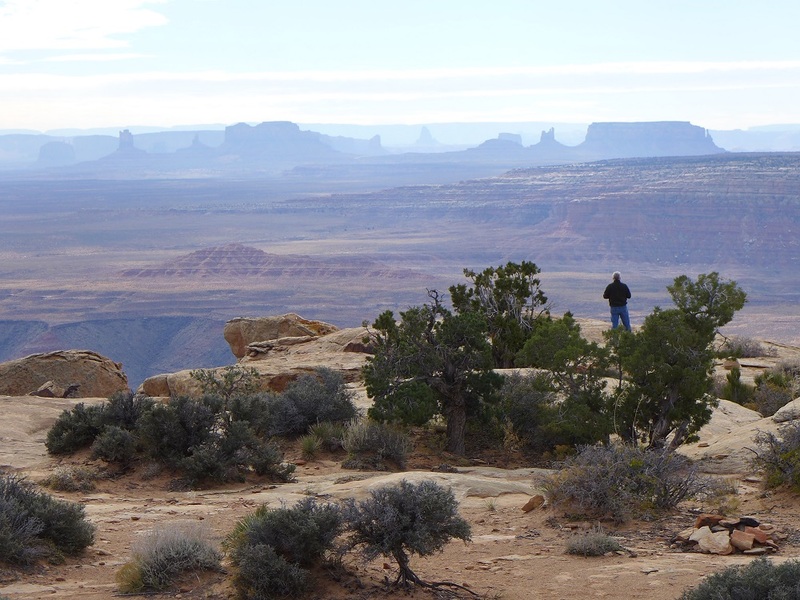 A tremendous view south out over the Goosenecks of the San Juan, to Monument Valley beyond. One of the most spectacular views in the West. 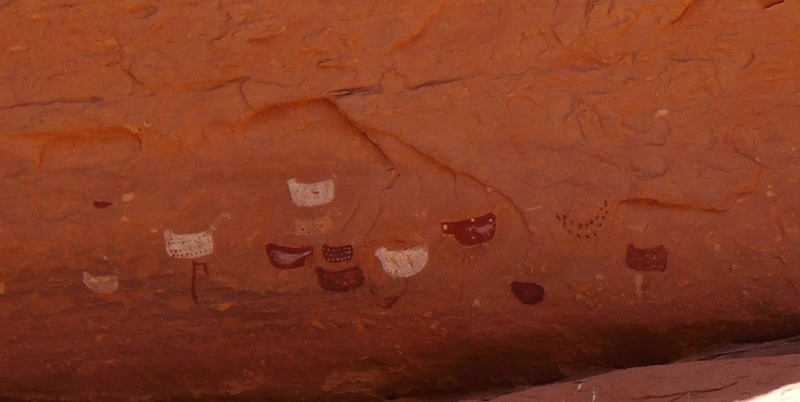 You can see Navajo Mountain, the Henry mountains and more. 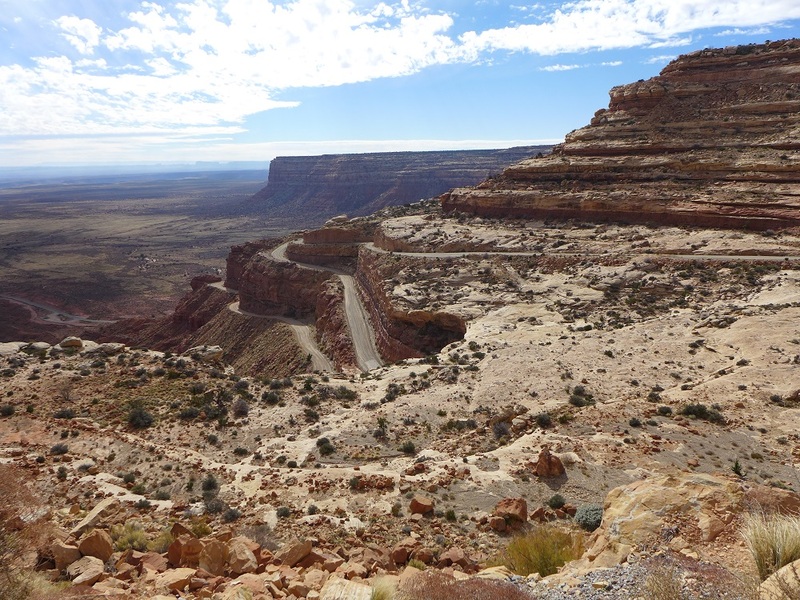 At the very end of Cedar Mesa is the Moki Dugway, a gravel section of the highway that switchbacks down the face of the mesa. That is Muley Point in the distance. 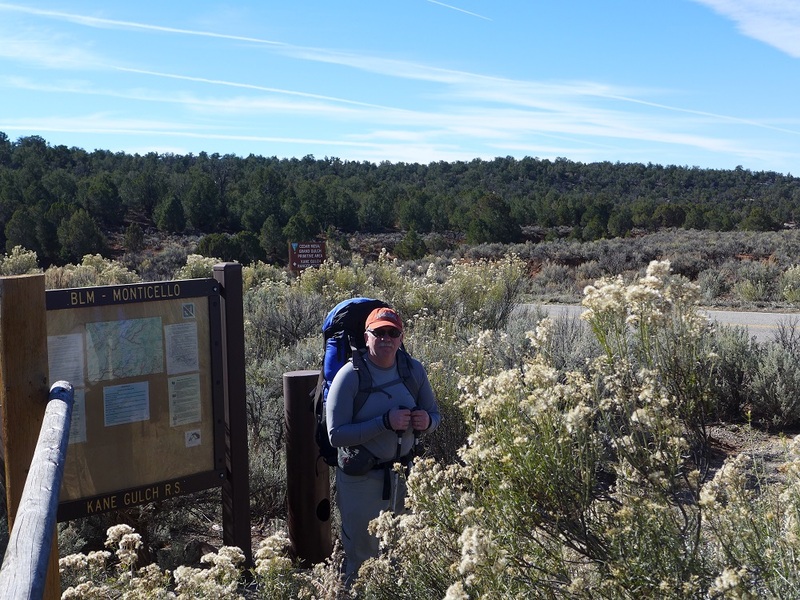 We stop for lunch in Mexican Hat, meh, and then head towards Farmington, NM for the night. Good meal at the 3 Rivers Brewery. The next front coming in is blowing up into a major winter storm so instead of going to Aztec Ruins N.M. for the morning we high tail it back to Albuquerque to get over the high passes before the snow really builds. Still slow going with lots of slush on the road but we make it by noon. Great lunch at Mary and Tito’s Café and some time at the Natural History Museum until our 4:30 flight which was late leaving due to de-icing from the snow fall even down in Albuquerque. Finally home after 1:00 a.m. Good trip, might have to go back again to see the things we still missed. 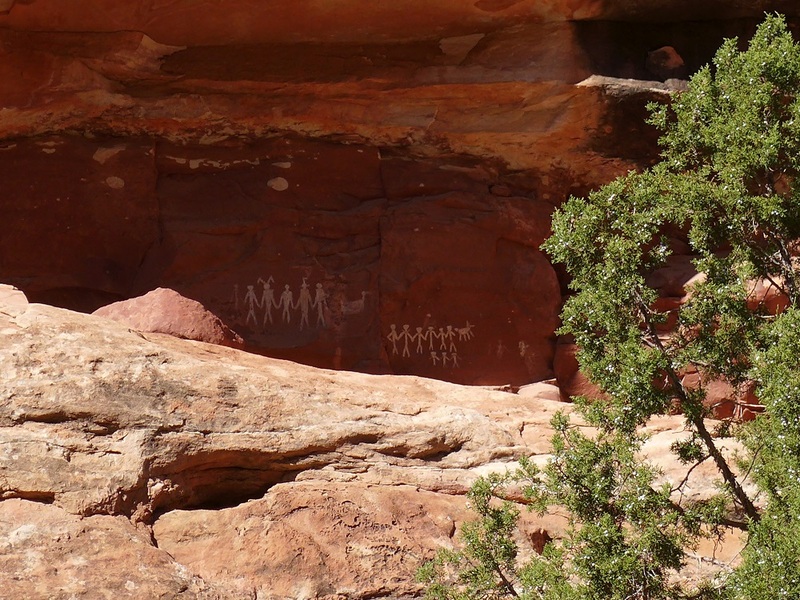 In Search of the Old Ones by David Roberts is a quick read and focused a bit more on the Cedar Mesa area but not entirely. 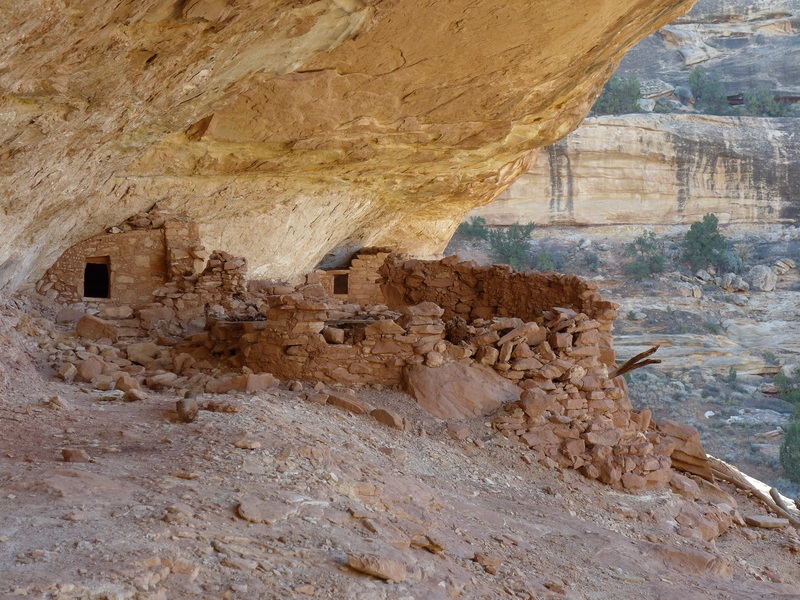 For a more thorough understanding of the Anasazi, their migrations and ultimately becoming the modern day Pueblos (hence the formal name Ancestral Puebloans) I encourage you to read House of Rain by Craig Childs. 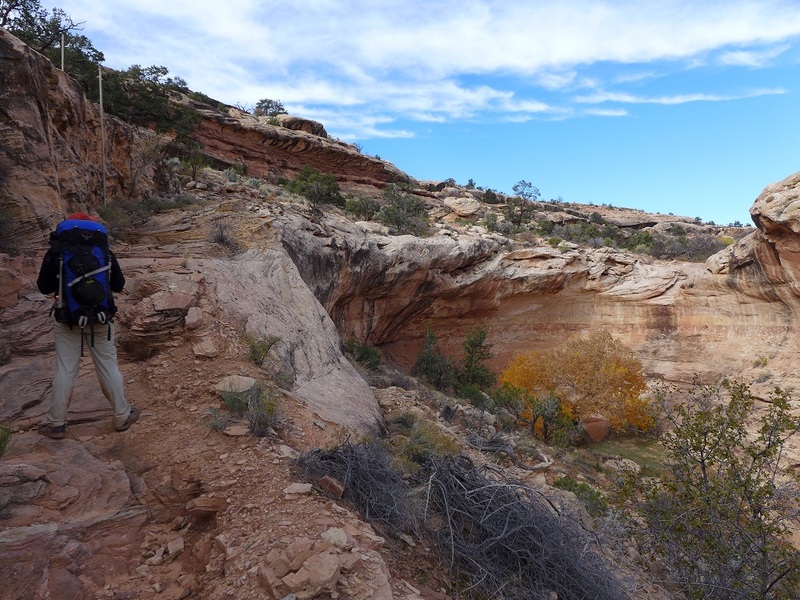 For actual trip planning, besides resources on the internet there several good books but Hiking Grand Staircase-Escalante & the Glen Canyon Region has a lot on Cedar Mesa and is very good and accurate. I have the 1998 first edition, there is a new 2nd edition that I have not seen yet so I cannot comment on how much updating was done. Many people use the Trails Illustrated map, not very detailed but it does give a big overview and the locations of the major springs and some ruins. 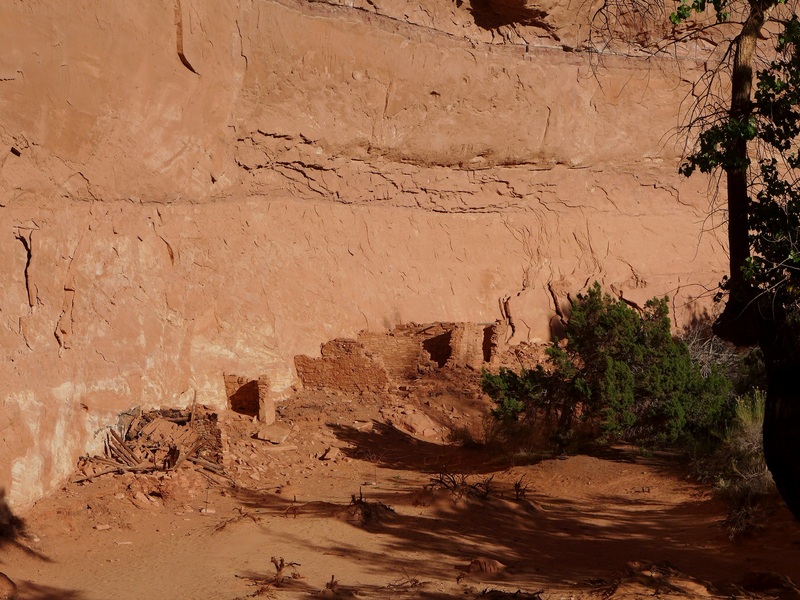 As usual I printed out maps from Caltopo but in a huge 1:12,000 scale so we could more accurately locate ruins and rock art panels (didn’t do so well in keeping track of our location at least for one day). There are a lot of ways to get in and out of GG but many of them are scrambling/climbing routes, a description of them can be found here. 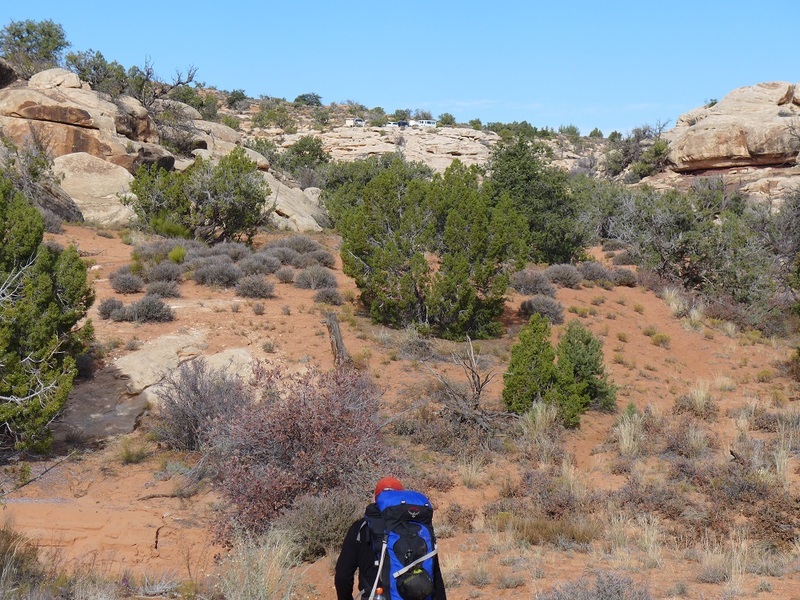 There are four main trailheads that people use. Going down canyon they are Kane, Bullet, Government Trail/Polly’s canyon (all on the east side) and Collins Spring on the west side. The problem is that the only easy loop is Kane to Bullet, to make other loops all others will require a scrambling/climbing exit, maybe a high clearance vehicle and/or an in and out trip unless you arrange for a shuttle. The roads to both the Government trail and Collins Spring trail heads have been done in passenger cars but in a year like this with so much rain it would be very difficult to impossible to drive them without high clearance. Here is the National Weather Service forecast for Kane Gulch and if you want to track the weather station at the Kane Gulch ranger station here is that link. We chose to arrange for a shuttle which was easy to do but not inexpensive at $200. There are several folks who do shuttles but we could only get in touch with Four Corners Adventures who did a great job. 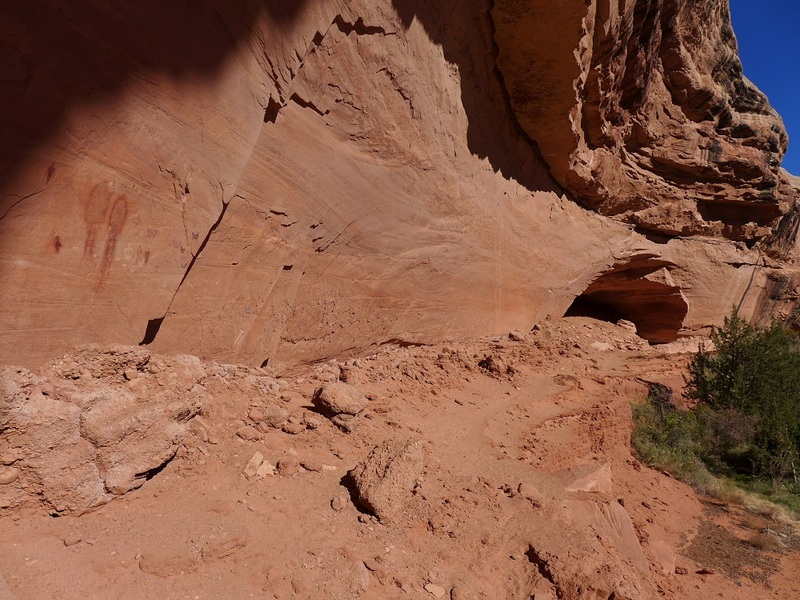 The heinous nature of the stretch between Bullet and at least Step Canyons (possibly worse this fall after multiple flash floods) and the few archaeological sites along there makes me recommend doing trips above and below that section. 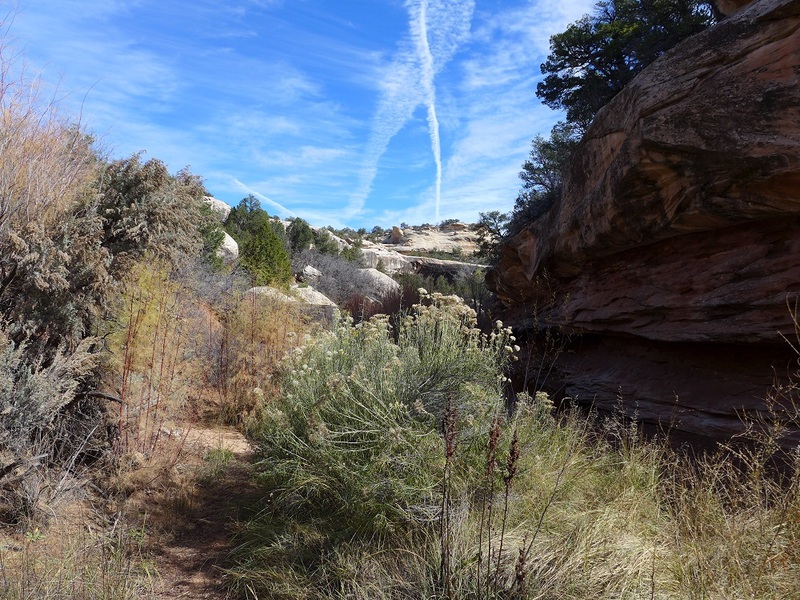 If you can get into the Government Trail it would make an easy access to lots of sites both up and down canyon or the possibility of loops using Deer or Water canyons or a shuttle and out Collins Spring. It is about equal driving distance from Albuquerque or Salt Lake City. It would depend on the relative cost of airfare and rental cars but the food is certainly better in New Mexico. Blanding is a good town to work from, more services and supplies than Bluff. 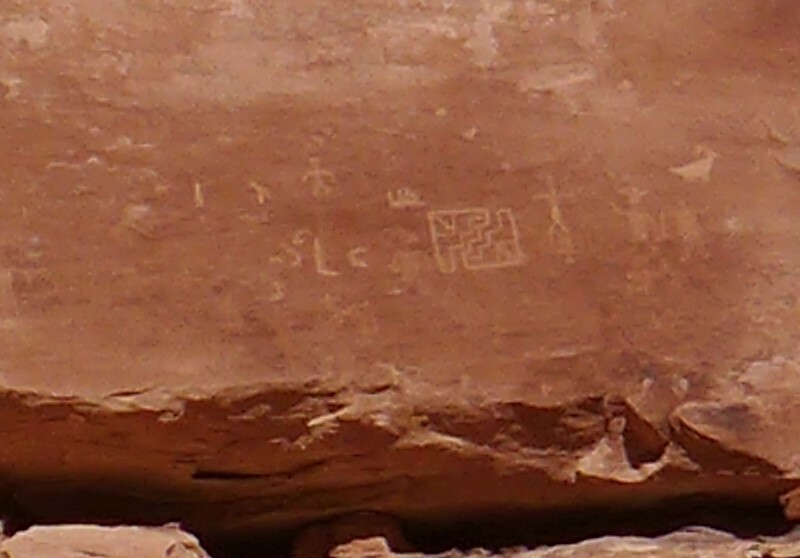 This entry was posted in Southern Utah and tagged Anasazi, Ancestral Puebloans, Cliff dewellings, Collins Spring trailhead, Grand Gulch, Kane Gulch, Petroglyphs, Pictographs, Rock Art, southern utah. Bookmark the permalink. Great trip report! This looks like an amazing area to trek through. Was wondering how much has changed since the first time you went to Cedar Mesa. It would be a shame if the site’s popularity was defacing/destroying the ruins and area. Thanks, I have also adjusted the pictures so they will enlarge when clicked. 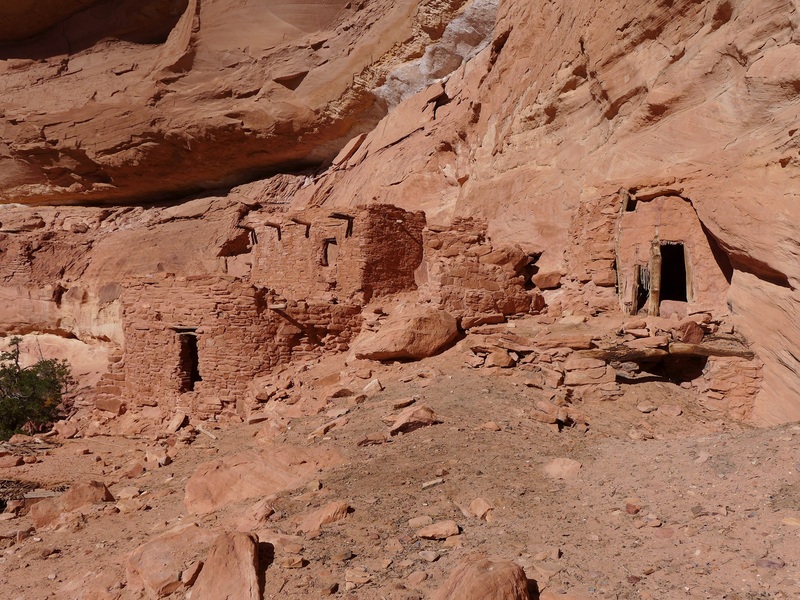 Certainly the upper canyon has seen a lot more use than 38 years ago and some of the ruins look to be well trodden. The trail there is also much more apparent than when we went through. More vegetative growth in places and certainly some evidence of fires but in general I would say things look in fair shape. What a great trip report Alex! Grand Gulch is one of those places I can’t wait to get back to. On our trip in 2011, we were only able to make it to Sheiks Canyon starting from Kane Gulch before we bailed due to flash floods. I’m thinking of going back in 2016 to go all the way next time. 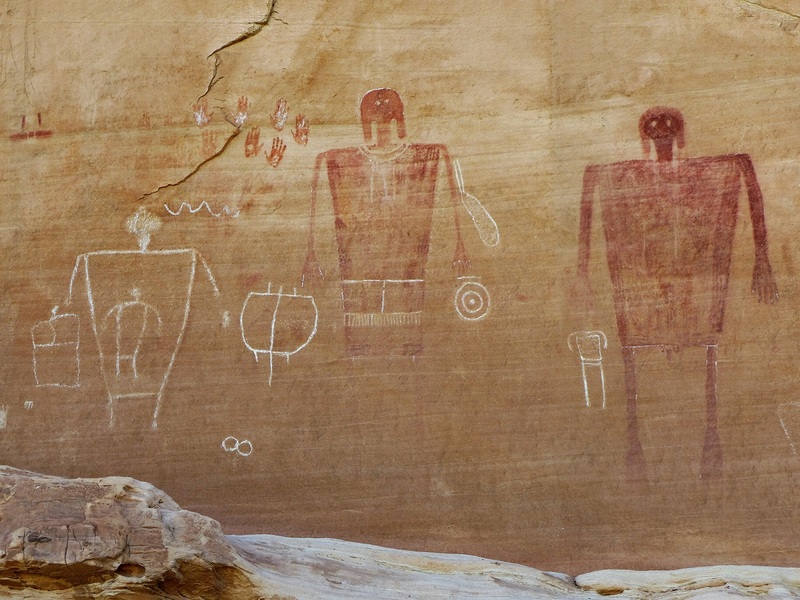 What was your favorite ruin or rock art panel? Enjoyed the photos and the description of your journey! Uncle Slayton; You are getting old. When you break two crutches on one trip it’s time to hang it up! Since your stubborn,when you get new ones, get the ones from England-the ones your heroes use. Not too old, too strong. Too late, a new pair of BD Trail corks in the house already. Great article and photos. I think what you refer to as the Dripping Canyon panel is actually the Dead Spar Knoll panel that is up Cow Tank Canyon. Bill thanks for that clarification, I wondered how we had walked by Cow Tank Canyon and must have once again lost track of where we were once we got out of the tamarisks and then encountering the llama group, in fact the llama group was probably stopped at the mouth of Dripping Canyon.